Sure, up in Northern New York, it is not often that we get tornadoes. Most people have never felt the winds or rains of a hurricane. We do not experience building-demolishing earthquakes, and have never seen tsunamis. Mass flooding is a rarity, though will happen periodically, and volcanic eruptions are a thing of our imagination. But Northern New York isn't completely free of natural disasters. Up here, we experience Northern New York Winters. People around here see the effects of natural disasters around the United States, and many wonder why people would choose to live in a place that annually gets hit by hurricanes, tornadoes, or earthquakes. They seem to forget that they chose a similar location to settle. 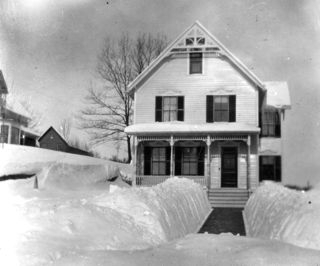 Every winter, we experience heavy snow storms, sometimes building up to four, five, even six feet of snow. Temperatures below zero are the norm; there are rumors that it has been so cold that a glass of water thrown into the air would freeze before it hit the ground. Temperatures like that are much too cold for children to be playing outside. 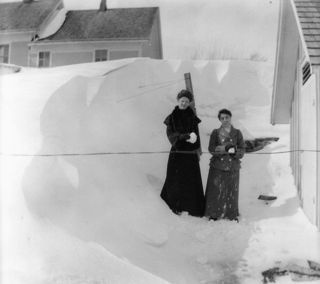 I can remember a New Years Eve with all of my cousins, sitting around the kitchen, watching the thermometer in our snow suits and boots and hats and mittens, waiting for it to read 0 degrees so we could go out and play because our parents told us that below zero was too cold playing outdoors. But people up here don't realize that our winters are equal to hurricanes and tornadoes in the south. We have found ways to adapt. When it starts getting cold, we start stocking up on canned goods, candles, flashlights, batteries, blankets, and heating oil or wood. Heavy winter coats, hats, and mittens adorn everybody from babies to great-grandparents. Plows are fitted onto trucks and tractors and snow shovels are perched next to the front door. Vehicles are fitted with snow tires and bags of sand and salt are purchased. 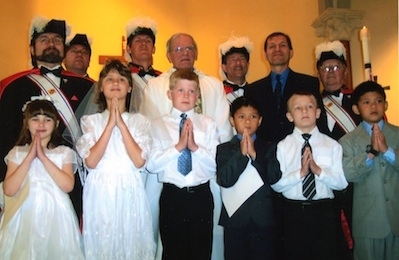 Kids start praying for snow days and dream about snowball fights and snow forts. Nearly everybody takes part in these annual preparations. Here in Northern New York, if you don't get ready for the winter, the winter will plow you over. But there is a definite beauty associated with the snow. 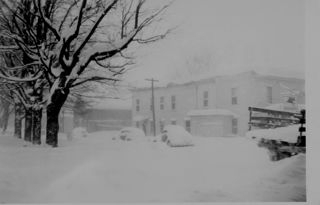 After the first big snow fall of the year, everything looks so peaceful and beautiful underneath the heavy blanket. Trees get their winter coats, children cover the yard in snowmen, snow angels, and snow forts, and snow plows make banks all along the roads to ensure that if a car is tricked into a patch of slick black ice, it has a buffer between it and a telephone pole. 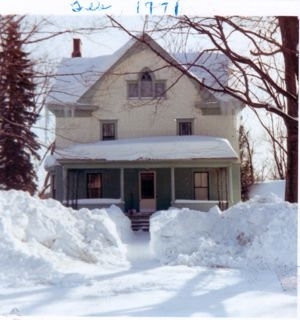 Sometimes the snow and ice do get the better of us, but the Northern New York Winters are definitely one of a kind. Many people complain about the cold and the snow, but year after year, they are here for the winter, despite the abhorrence. 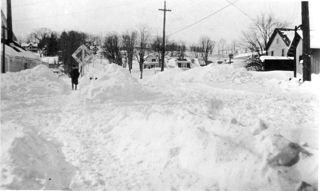 But I would take a Northern New York Winter over a tornado, hurricane, or earthquake any day. Some information in the month's Spotlight has been borrowed from Fred Schneider's article "Along the Black River." 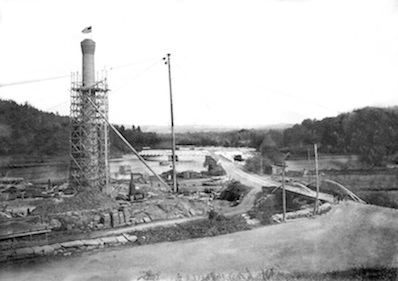 The first bridge over the chasm at the top of the High Falls was constructed in 1835 and 1836 by Cap. 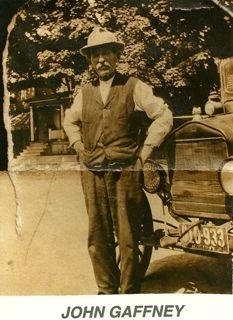 John Whittsley, head of one of the pioneer families of Lyons Falls. 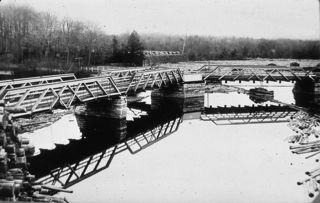 According to records, the bridge looked like "a devil on two sticks". However, it was actually remarkably well constructed according to standards of the day. 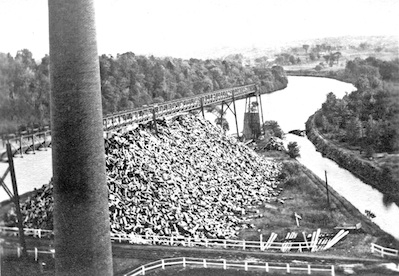 It was a wooden structure that spanned the Black River at High Falls. 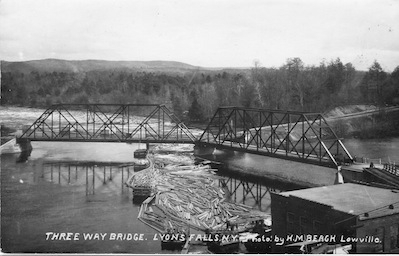 The first Lyons Falls Bridge was in use during a colorful period of North Country history. 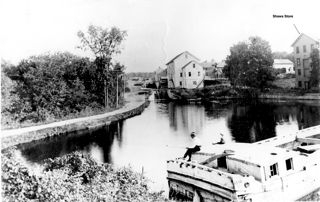 Its use spanned the years during which controversy over the constuction of the Black River canal was raging. 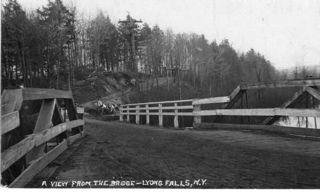 Twice daily, the mail was carried to and from Lyons Falls over the bridge by stage coach. The Post Offices for the area were located at Lyonsdale, Greig and Brantingham. 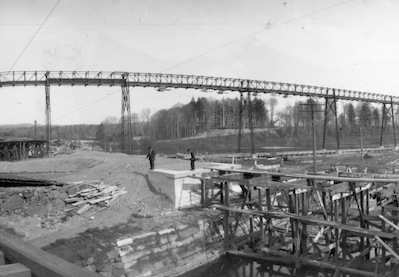 With the opening of the Canal, the state decided to construct bridges at key locations along the route. 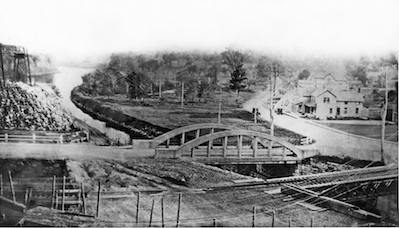 In 1853, a decision was reached to construct a new wooden bridge that would better serve the growing traffic brought on by the Canal. 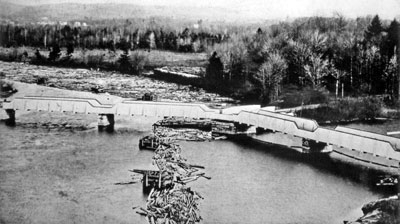 The new bridge had three approaches, one on the west shore of Black River, a second on the east shore of Moose River and the third at the confluence of the two rivers. 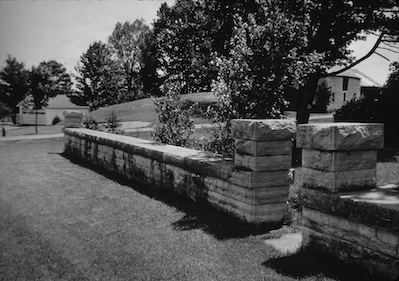 It was originally constructed with high side walls that were later removed. The bridge was called the White bridge for years by the residents because of the high white board side walls. 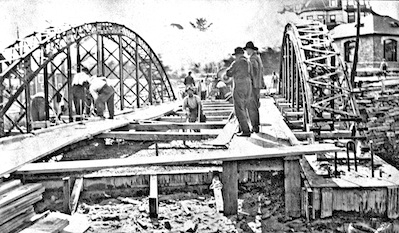 Bridges of this type were called covered truss bridges. 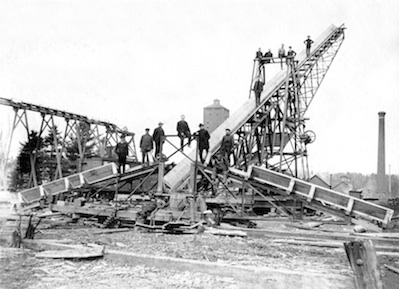 Gradually, as transportation methods became modernized, the White bridge became outmoded. 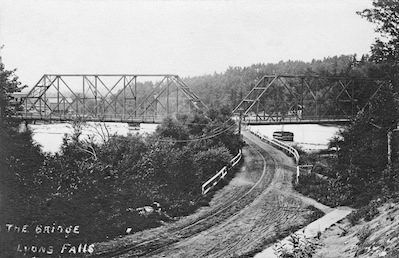 With the advent of the automobile, the bridge was no longer considered safe for highway travel. 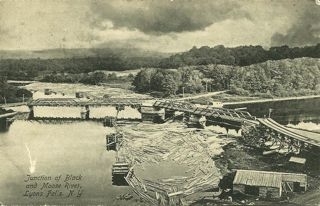 The old wooden bridge was torn down and was replaced in 1916 by another Y bridge that was featured in the newspaper column, "Ripley's Believe It Or Not". 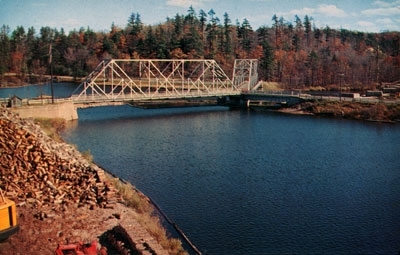 In October 1963, construction began on two new spans, one over the Moose River and the other over the Black River. 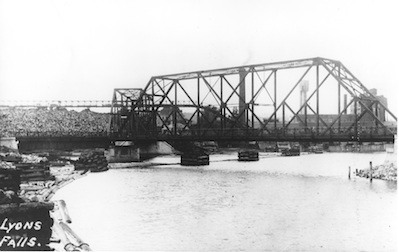 The spans replaced the Y bridge, which was then torn down. Cement supports for the three way bridge can still be seen peeking out from the Black River. Fragments of history are often lost over time as new and interesting pieces of modern history surface. However, the Big Barn is not one of those items that disappear as time moves on. 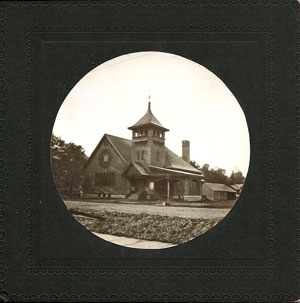 Although construction began on the barn in 1859, the memory of the barn that was once the largest in the state of New York has not been tarnished or forgotten in the past 153 years. 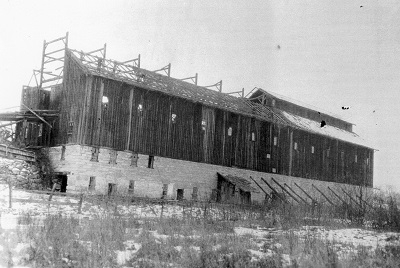 The Big Barn was designed and built under the supervision and instruction of Lyman Rasselas Lyon, the namesake of Lyons Falls. 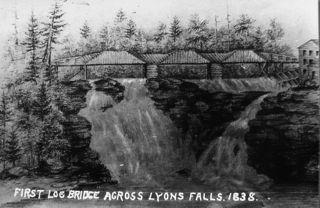 The son of Caleb Lyon Senior owned most of the land that is now called Lyons Falls. 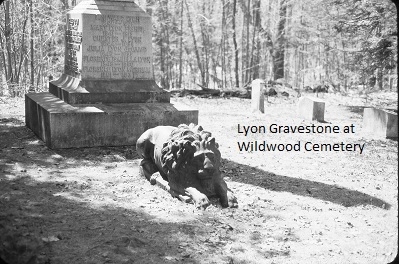 His brother, Caleb Lyon Junior, owned the land that became Lyonsdale. 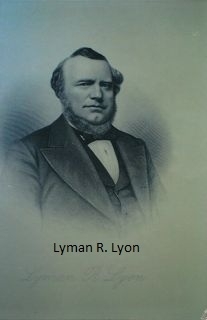 Lyman R. Lyon was recognized as a fairly strong architect as well as a civil engineer. This knowledge, combined with the desire to be a farmer, led Lyman R. to embark on one of the most startling adventures of his life; building the Big Barn. Lyman R. Lyon built the barn on his 800 acre farm in order to house his 90 cows. 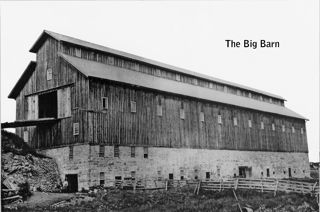 The barn was 221 feet long and 48 feet wide. 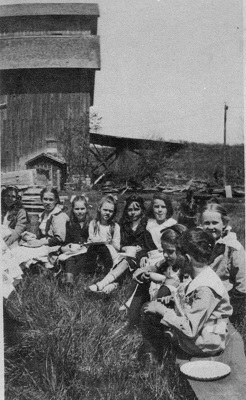 On the side of the barn overlooking the beaver meadow, the barn was four stories high. The basement of the barn was large enough to hold 200 head of cattle. Thirteen ventilators ran from the stable to the top of the building to circulate the air and keep the animals safe. The highest peak on the roof reaches 80 feet. The basement of the barn is said to have had a root cellar and machinery for doing the strenuous farm chores that did not yet have machinery to replace men, such as threshing, cutting roots, and carrying feed to the animals. This machinery was powered by water power. 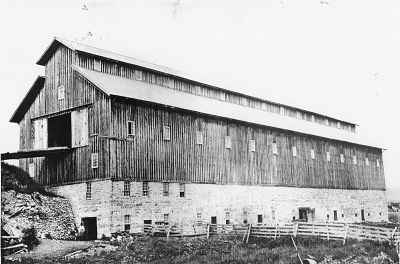 The barn was completed in 1868 after the workers who had served as soldiers during the Civil War returned home to Lyons Falls. 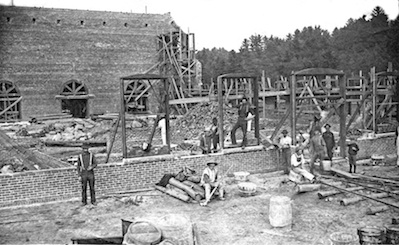 The barn cost around $12,000 to build when all the supplies and laborers were factored into the cost of construction. There were around 500 men who contributed to the project. 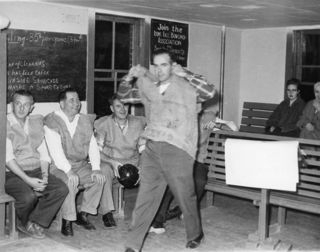 Since Lyman R. was against smoking and drinking, the men who helped raise the barn were served an endless supply of donuts and coffee, but not an ounce of alcohol. 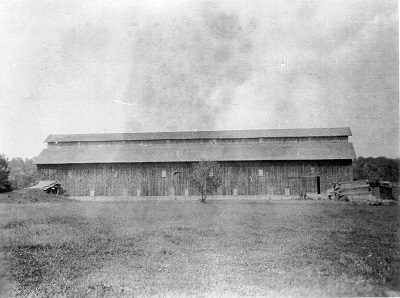 On completion, the barn was the largest barn in New York State. 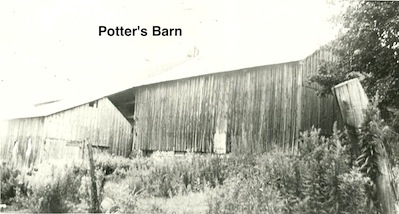 The barn was torn down in 1929 on the orders of the Hone family, who were the current owners of the property. 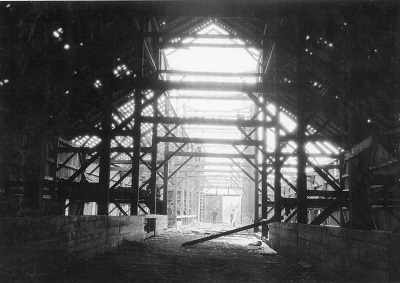 The lumber was sold to construct three new barns and three camps. The money was used by the Hone family during the Great Depression. 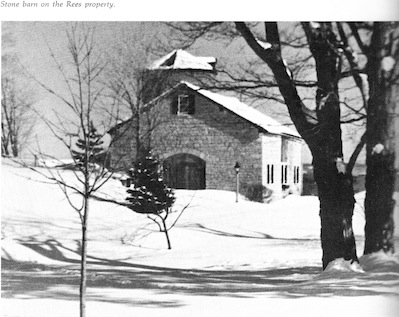 Although the barn no longer stands today, parts of the foundation still exist on what used to be part of the 800 acres Mr. Lyman R. Lyon owned outside of Lyons Falls. 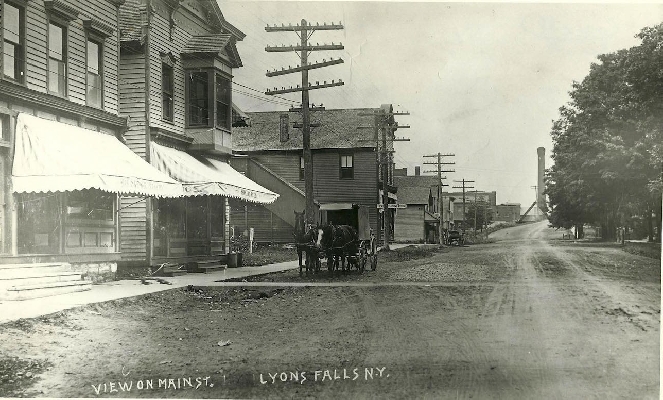 Walking or going by horse and carriage for three miles to Port Leyden was how Lyons Falls Catholics attended mass before the year 1909. 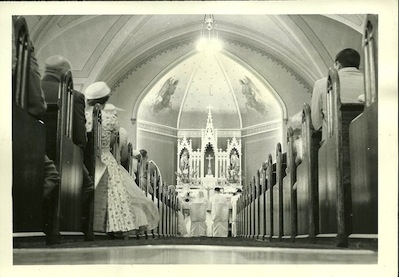 Mass was celebrated once a month in the Shaw & Ryan Hall, Gaffney Opera House and later the Burkhart Opera House. An altar was made by putting planks over two sugar barrels. 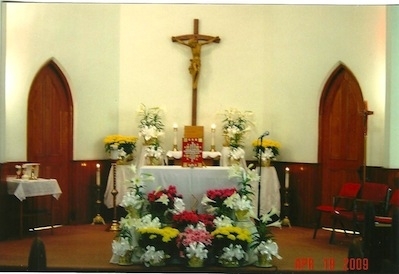 Mrs. Ed Ryan and Mrs. John Cronin were in charge of the altar for many years. Mrs. Ryan would take down one of her lace curtains from her parlor to cover a white sheet on the planks. 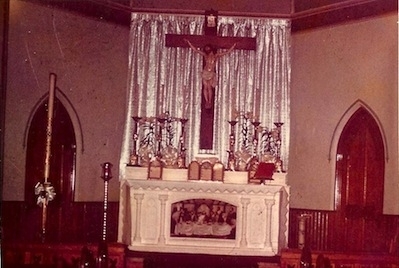 This altar was used for several years until Frank Hoskins made one with a high back. 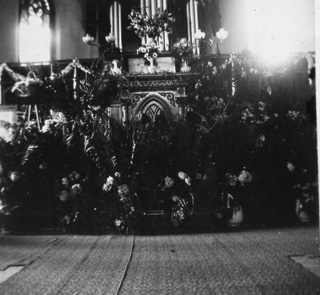 After 1909 this new altar was taken to Port Leyden and used for masses at Calvary Cemetery. 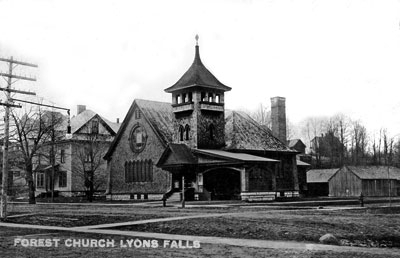 Under the leadership of Reverend John Dean plans were established to build a church in Lyons Falls. 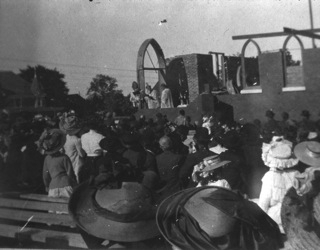 Bazaars, fairs, suppers, dances and card parties were held to start a fund for the new church. 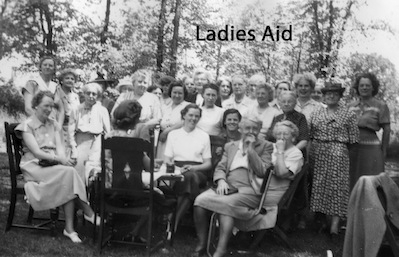 A picnic was held on every Fourth of July at the Riverside Park on Laura Street. 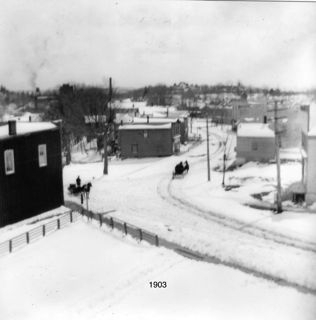 Trains brought in people and others came by horse and carriage. A goodly sum was realized from these affairs. Bazaars and dinners were the highlights of the day. In the evening a crowd gathered to enjoy the display of fireworks and later a dance. 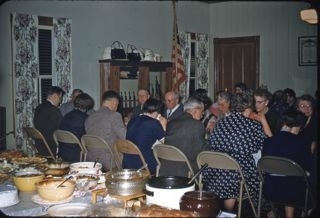 Nearly 1000 people attended this affair each year. A site was chosen at the crest of the hill south of the school on McAlpine Street. Much blasting had to be done on this site. 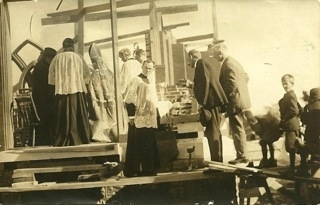 Work began in July 1909 when the foundation was laid. The Gothic Style church is built of brick with limestone trimming. 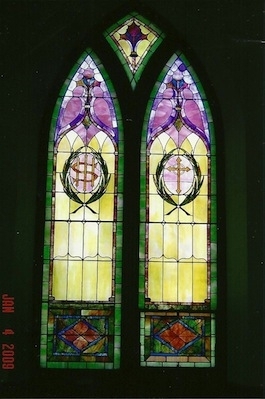 Money was raised for some of the leaded windows by holding a contest. 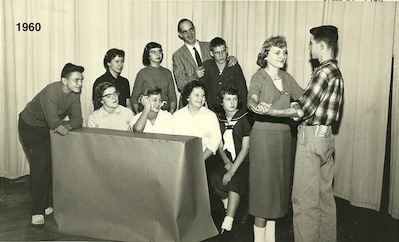 The prize, a diamond ring, was won by Julia Collins House of Lyons Falls. 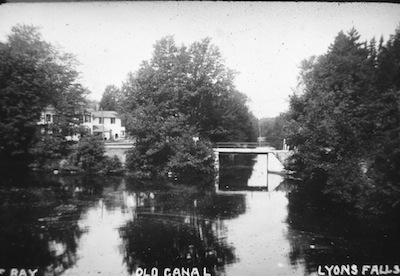 It is evident that the Black River Canal played a major role in the economy of Lyons Falls in the late 1800s, but it is unclear to people today as to how great an impact this truly was. 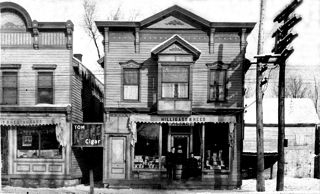 This influence is exemplified by a one Watson Shaw and his general store in 1895. 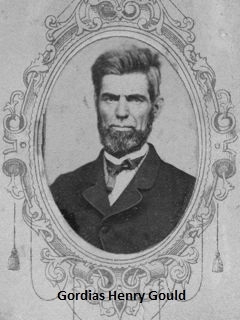 Watson Shaw was the son of Abraham and Mary Reid Cook Shaw. 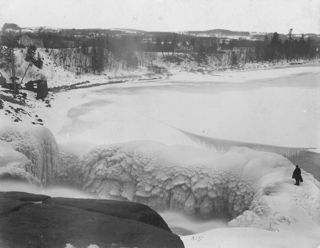 He was born in Lowville and came to Lyons Falls when he was young. He never left. 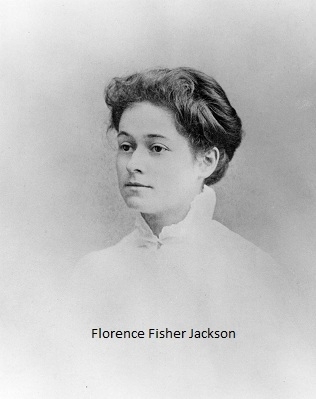 In 1891, he married Florence Higby Jones and they lived together until Mrs. Shaw's death in 1935. He died in 1943 after a long battle with an illness. 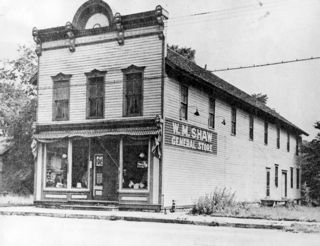 Mr. Shaw opened Shaw's general store when the Black River Canal was booming. 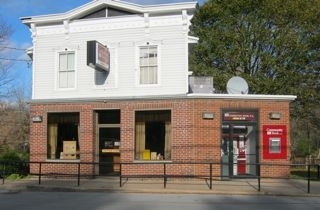 The original store was located on lower McAlpine St, right on the bank of the Canal. The purpose of the store was to manage the lively canal trade. 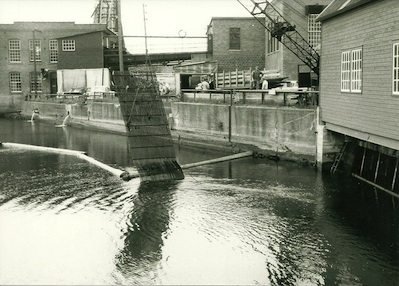 There were four stories at the back of the store, reaching down to the canal and specially designed to lift goods from the boats to the store. 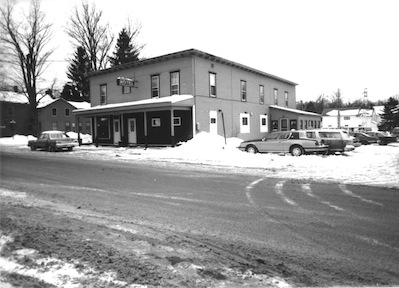 In 1895, a new store was built on Center St to accommodate the switch in business from the Black River Canal to the Black River Railroad and the new local business, Gould Paper Co. The new building contained two floors for the retail business and basements for storage. The store contained groceries, drugs, medicines, boots, shoes, crockery, clothing, and furniture. 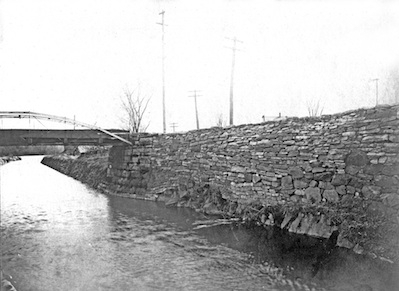 Plus, Shaw was a wholesaler, meaning he sent boatloads of goods, such as potatoes, on the canal to New York City. 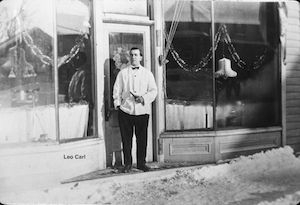 He was the leading merchant in Lyons Falls for 54 years, until he was forced into retirement as a result of a broken hip. 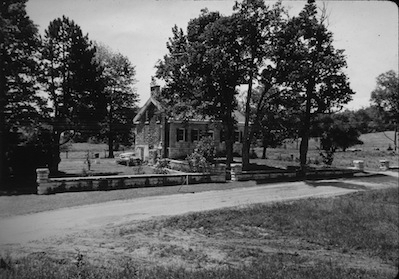 In 1940, the Village bought the building. The ground floor soon became the Lyons Falls Free Library while a bowling alley was put in the basement. 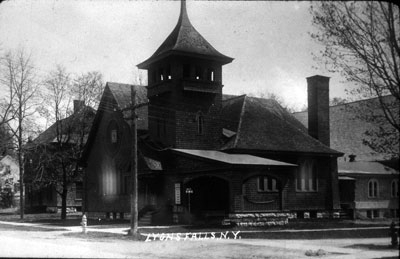 The front of the ground floor became the fire house. 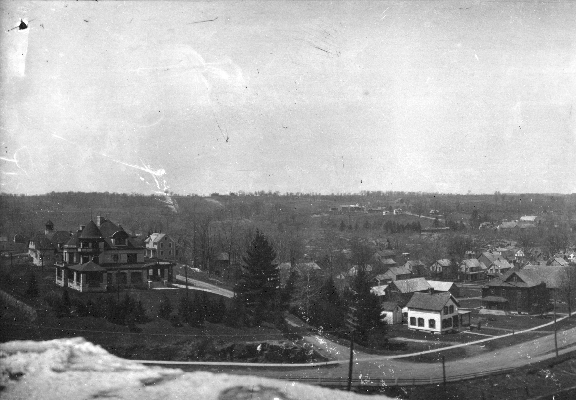 The second floor became the center for the village board, club rooms for the Vigilant Hose Co., American Legion, and the Auxiliary and Women's Club. 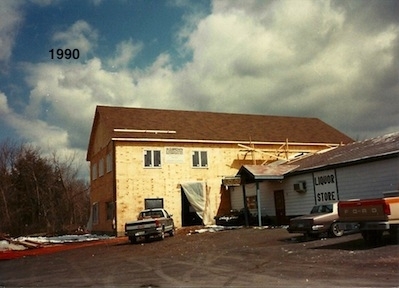 The building was torn down to accommodate the expansion of the paper mill in 1981, but people still remember Shaw's general store. Anybody familiar with the Turin, Lyons Falls, and Constableville area is typically familiar with Potters Corners. Potters Corners is located at the intersection of Route 26, Route 12D, and the Powell Road in West Turin. This "famous" location just outside of Lyons Falls is a frequently traversed ground for travelers, yet the history of the name is usually a mystery to those who pass through the area. 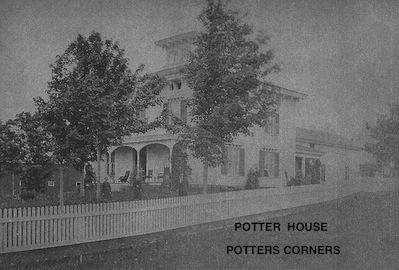 The roots of Potters Corners can be traced back to the Rees/Potter family, a family joined in the marriage of Mary Permelia Rees and Marshall Ney Potter in 1882. 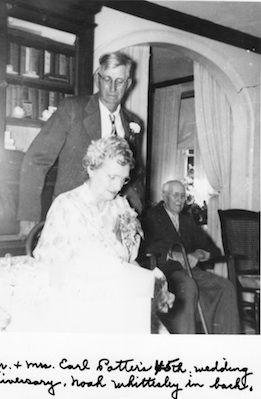 Mary and Marshall Potter gave birth to Reese Marshall Earle Potter, father to H.E. Reese Potter. A daughter of Reese Potter, Emily Potter Lodestro, lives in Falconer, New York and a son, Reese M. Potter, lives in Heber Springs, Arkansas. The Rees family originated in Wales; William and Mary Rees, both born in the 1770s, traveled to America and settled in Lewis County in 1801. William was a stone mason who contributed to the construction of Constableville's famous Constable Hall. 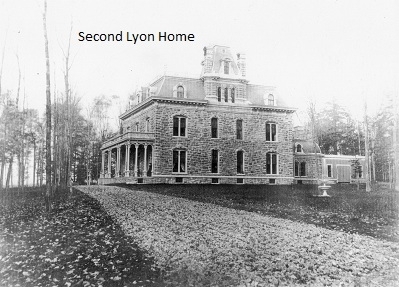 In return for William's help in building Constable Hall, he was given a large tract of land in Lyons Falls. 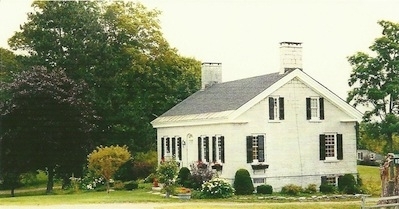 This became a bustling farm complete with two large stone houses, both of which remain today. 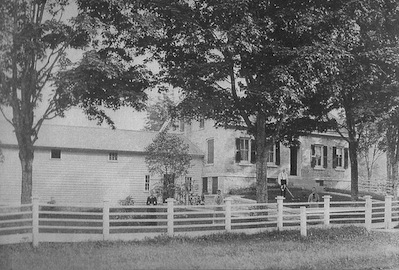 The larger of the two homes is occupied today by Oren and Elizabeth Cook, as is a portion of the farm land that had originally belonged to the Rees family. 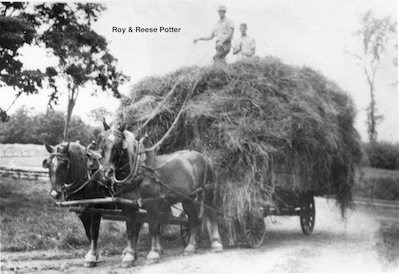 Potters Corners is located just up the road from the Rees farm. It is believed that the area was named for Eugene Potter, a farmer of the area who had been active in politics. 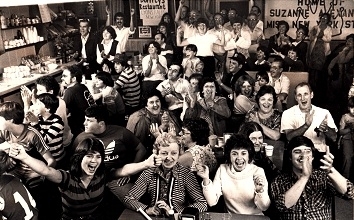 The first mention of the name "Potters Corners" in newspapers was found in a paper from 1922. Since the Potter family and the Rees family were joined in 1882, it is logical to believe that this area was named for a relation of this family. 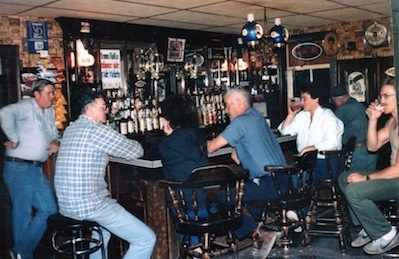 Like most of the buildings and businesses in Lyons Falls, McManus's has a rich history. 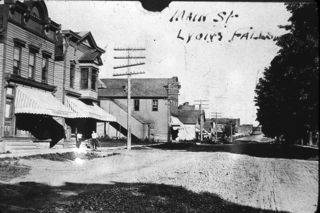 The property on which McManus's currently stands originally belonged to Caleb Lyon Sr., the original founder of Lyons Falls. 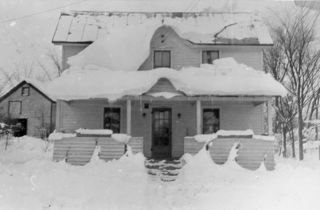 He transferred the property to his daughter, Laura, in 1867. 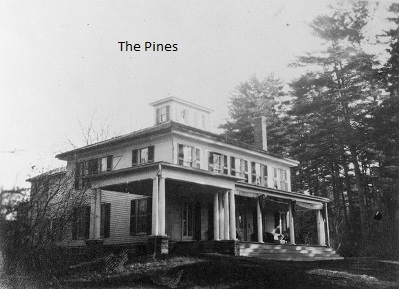 In 1880, the property was sold to Stephen Gaffney and, in 1881, was transferred to his son, John Gaffney. 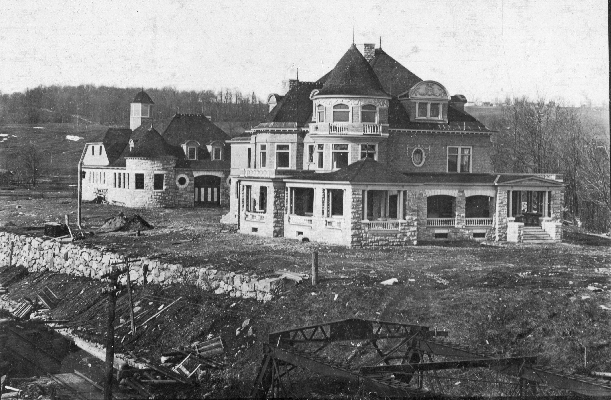 John Gaffney made additions to the property and kept a hotel there until his death in 1921. 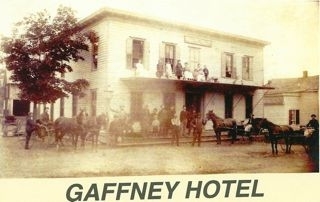 The hotel was called Gaffney's and was a large influence on Lyons Falls. 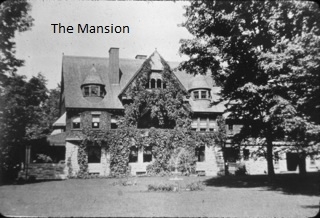 After John Gaffney's death, the property and hotel was transferred to his daughter, Elizabeth Gaffney Farney and her husband, Joseph Farney. 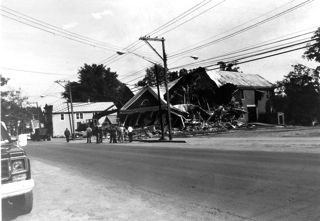 The two made more additions to the hotel and changed the name to Farney's Hotel around the 1940s. Joe Farney sold the hotel to Bill McGee in 1961. 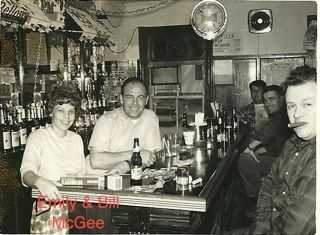 Bill and his wife, Emily, ran the hotel under the name of McGee's until they sold it to Mary Ellen and Tom McManus April 1, 1975. 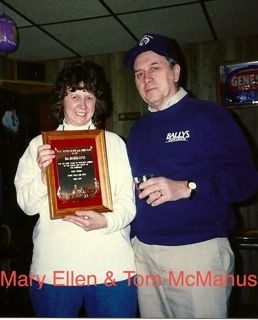 Mary Ellen and Tom changed the name of the hotel to McManus and changed the focus of the hotel from that of a boarding house to a bar and a restaurant. After they changed the ownership of McManus to their son, Fred McManus, the focus of the business has been more of a restaurant and a nutrition center. McManus is a site of the Lewis County Meals on Wheels Nutrition Program that helps supply food to the elderly in Lewis County five days a week. But despite the new role of McManus in the area as a nutrition center, it still plays a large role in the Village as a restaurant. 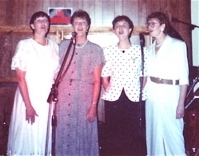 Mary Ellen McManus stated: Over the years [McManus] has supported and helped with various community benefits, including the events with the fire department, athletic banquets, academic banquets, and numerous other organizations. She says that all four of her boys, Paul, Fred, Jake, and Doug (now deceased) and their families have helped to build and maintain the business. In addition to the restaurant and the nutrition center, McManus also does catering events both on and off the premises. The restaurant is open Monday through Friday from 10:00-2:00. Be sure to stop by and check them out! 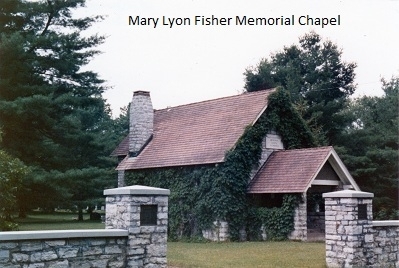 The Mary Lyon Fisher Memorial Chapel, located in Wildwood Cemetery on the outskirts of Lyons Falls has been added to both the National and State Register of Historic Places. The process for this honor is a long one and thankfully, Susie Hammecker was willing to fill out the numerous forms and follow all of the procedures that were necessary for this development. 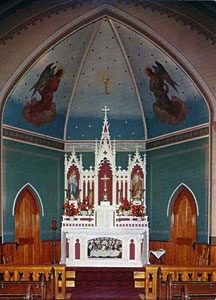 The chapel was designed by Gouge & Ames of Utica and was built in 1921 by W.H. 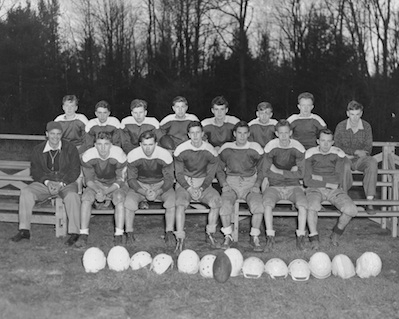 Rich & sons of Lowville. 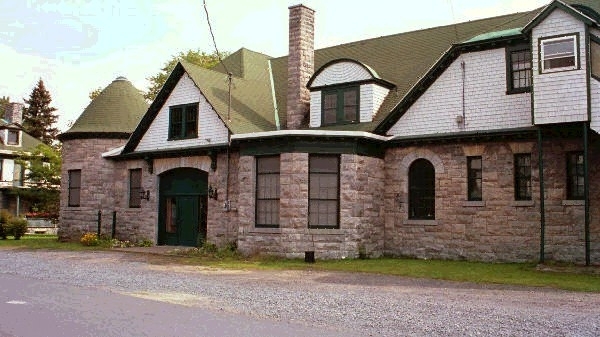 The building models a Gothic style of blue limestone, twenty inch thick walls, and dark red asbestos-cement shingles. 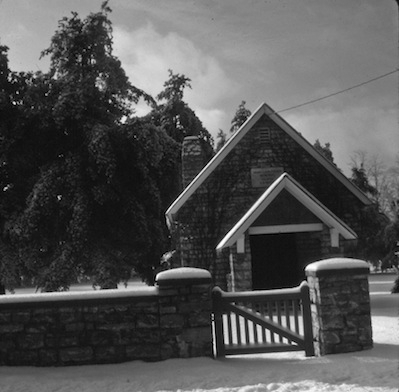 The only things separating the chapel from the road are five stone pillars and a low fence. Four steps covered by a small porch lead to the carved, double wooden door that leads to the main room. 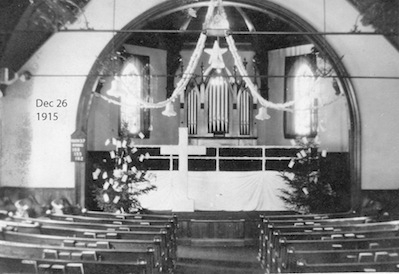 Above the door is a white marble tablet inscribed with the words "Mary Lyon Fisher Memorial Chapel, 1921." Maple floors cover the interior and six windows allow light to enter the chapel through the warm, amber glass. There is a trap door in the center of the room that contains an elevator apparatus to move caskets from upstairs to downstairs where up to 15 caskets can be stored in the winter in built in shelving units. In the outside rear of the chapel, there is a double door hatchway that leads downstairs. 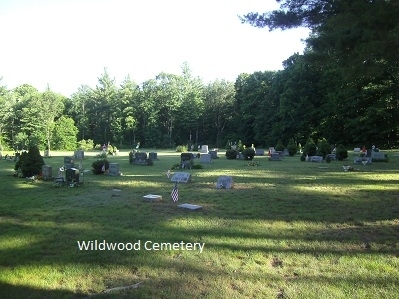 Behind the chapel lies the Wildwood Cemetery. 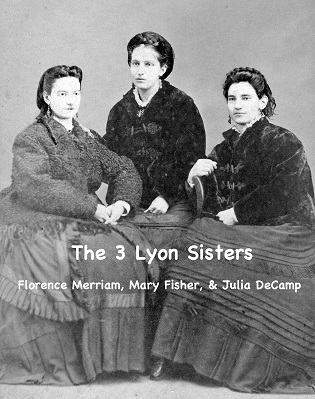 The land for the cemetery was donated by Mary Lyon Fisher, Julia Lyon DeCamp and Florence Lyon Merriam in 1906. 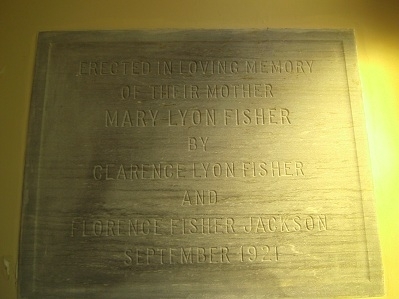 The chapel was given by Clarence Lyon Fisher and Florence Fisher Jackson in memory of their mother, Mary Lyon Fisher. 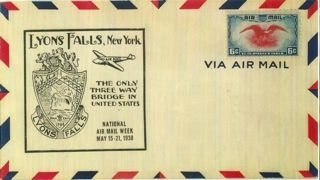 It was built in 1921 and dedicated in September of 1922. 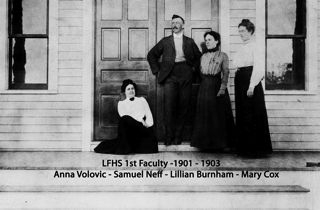 Mary Lyon Fisher was born November 20, 1841 to Mary B. Northrup and Lyman R. Lyon. 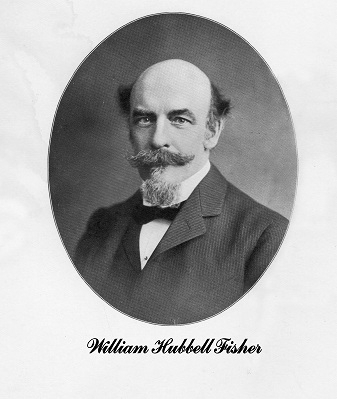 In September 1873, she married William Hubbel Fisher of Cincinnati, Ohio. He died in 1909. 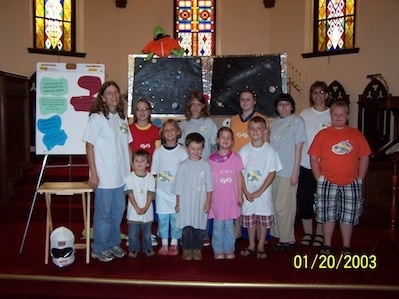 It is said that Mrs. Fisher was a noble, generous, and unselfish Christian, always ready to lend a hand to the needy. She died suddenly in 1913. 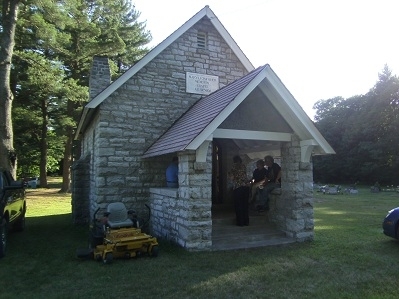 Both her church, Forest Presbyterian Church and her home, The Pines, are on the State and National Register of Historic Places, and now the her chapel is on the Register as well. 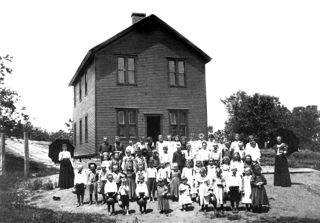 In the late 1800s and early 1900s, Lyons Falls did not have one consolidated, stationary school system; rather, it had a series of smaller buildings that served as a school until a larger one was built. 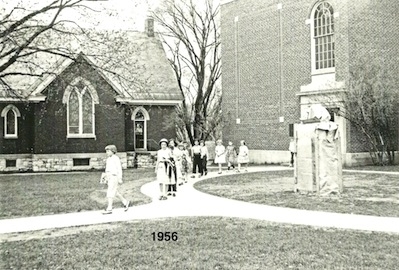 The most well-remembered of these schools was located on Gorham Street (pictured left). 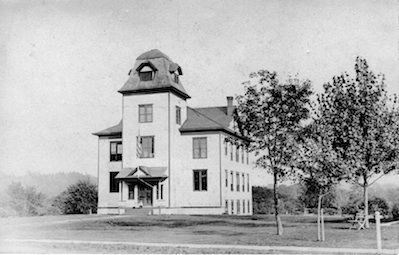 The school had been built in 1893 and was used until the high school was built on McAlpine Street. Classes at this school were taught by Maurice Walsh. 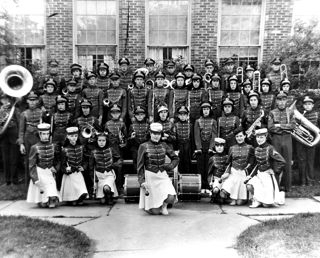 The townspeople knew that one combined high school would be more beneficial to the community than the system the Village had then, so in 1900, land was purchased on McAlpine Street and a new high school was built. 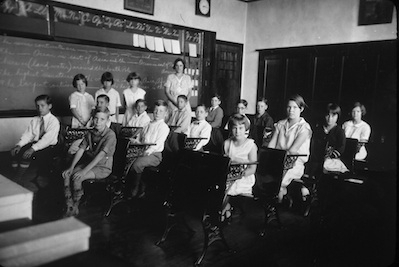 Classes at the new school were taught by Anna Volovic, Samuel Neff, Lillian Burnham, and Mary Cox. 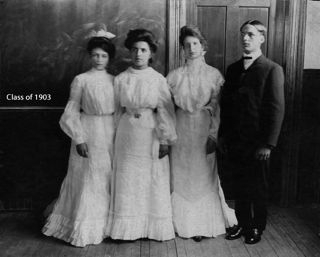 The first graduating class from the new school was the class of 1903, which consisted of four students. 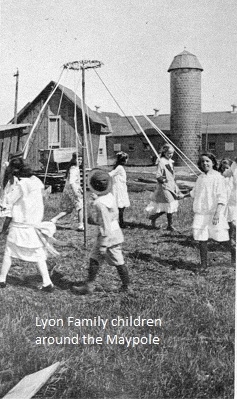 However, this school was soon outgrown, requiring the construction of another new school building. 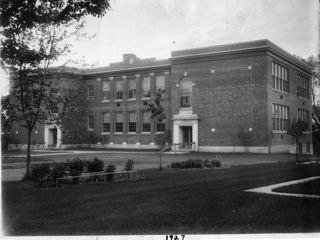 In 1927, the current building was erected at the same location. This served as both the elementary and high school for the youth of Lyons Falls until South Lewis High School was built in 1963. 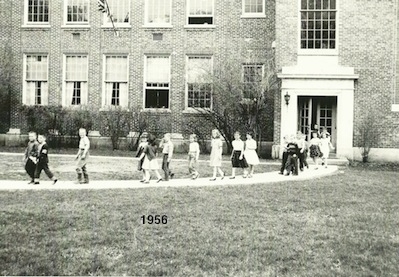 The building continued to serve as an elementary school until it was closed in 1983. 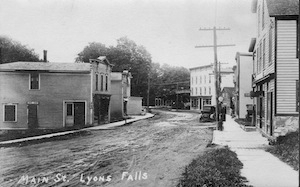 The building still remains as a reminder to the people of Lyons Falls of what once was a small town's fondest memory (pictured right). 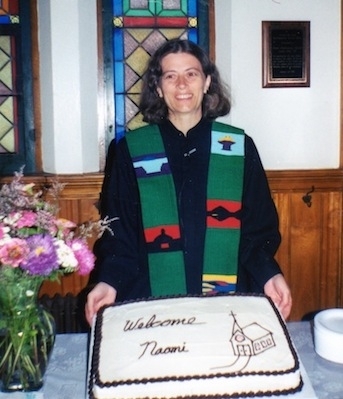 Massachusetts resident Nance Moran searched online for an organization that might have interest in the Bible. 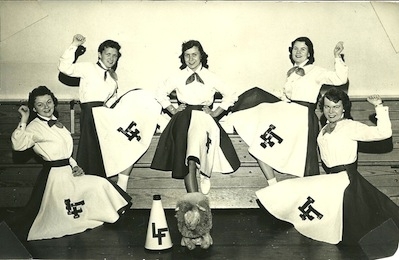 When Nance located the Lyons Falls History Association's website, she e-mailed a note to the Village's unofficial historian, Shirley VanNest, saying, My father was working in a local town waste dumping station and he pulled a Bible from the garbage piles. Do you know of any family members or historical society that would like this Bible? I know I would like it if it were my family lineage. Shirley received the message and began alerting the rest of the History Association that the Mary L. Lyon Bible had been found. Within a single day, the historical community was buzzing with excitement about the fact that the treasure had been found and that it was destined to return home to Lyons Falls where it belongs. 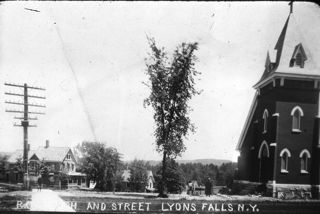 The significance of the Bible's return to the community of its origin lies in the historical prominence of the Lyon family within the Village of Lyons Falls and the Town of Lyonsdale. Mary Lavinia Lyon was the daughter of Mary B. Northrop and Lyman R. Lyon, and granddaughter of Marrietta DuPont and Caleb Lyon. 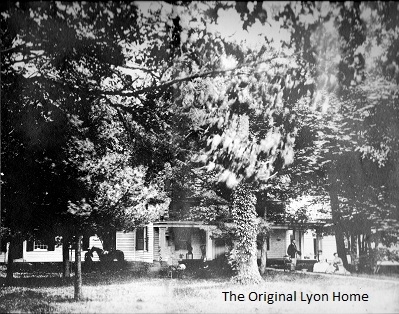 Mary's grandfather, Caleb Lyon, established the first permanent settlement at Lyonsdale in 1823. 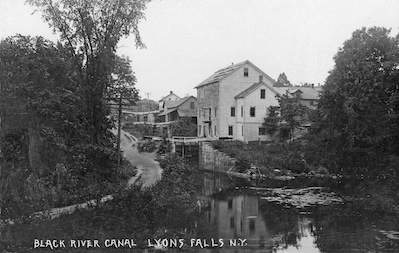 His son, Lyman R. Lyon, acquired large tracts of timber land in the western Adirondacks and developed the water power of the Black River, giving his name to the mill community of Lyons Falls. 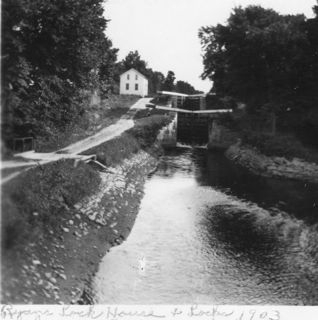 While a member of the state legislature, Lyman actively promoted construction of the Black River Canal as a regional transportation artery to Rome and the Erie Canal. 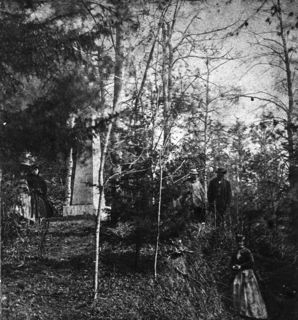 From her parents, Mary L. Lyon, who after marriage became Mary Lyon Fisher, inherited large and valuable timber holdings in and around the area. As a prominent land holder in the area, Mary Lyon Fisher actively managed her holdings from the late 1880s until her death in 1913. 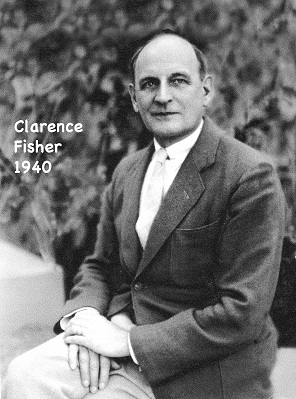 The Lyon-Fisher family remained the region's dominant landowners and timber industrialists through several generations until the 1950s. 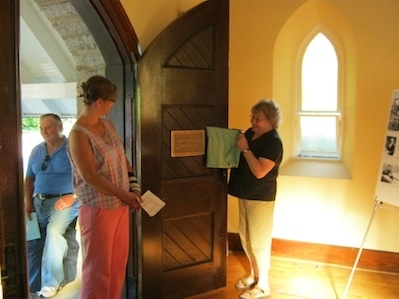 Essentially, the return of Mary Lyon Fisher's Bible to the Village of Lyons Falls marks the return of a local historical treasure to the community which was so appreciably affected by the Lyon family's contributions. Clearly, by the handwritten inscription on the second page of the Bible, it was given as a gift to Mary L. Lyon by her mother. To the casual observer, the date is otherwise meaningless. However, because Mary L. Lyon was born on November 20, 1841 and the date the gift was given was November 20, 1862, it appears to be given as a 21st birthday gift. Because the gold guild on the pages is well worn and there were many passages marked within it, it can be surmised that the gift was a frequent and treasured companion of Mary L. Lyon's. 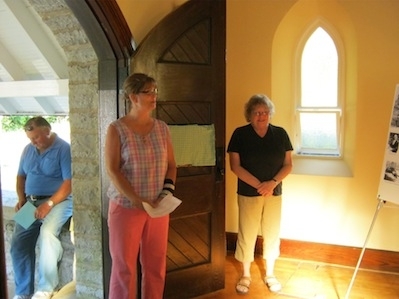 Because Mary L. Lyon Fisher was a devoted lifetime member of historic Forest Presbyterian Church, the Bible's return to Lyons Falls creates as much interest and excitement for members of Forest Church as it has for the History Association. When the ornately embossed brown leatherbound Bible was taken to be shown to church-goers a few weeks ago, the interest was intense, perhaps even passionate. Churchgoers noted the small size of the Bible, approximately 5 inches high, 3 inches wide, and 2 inches thick. It was deduced from the petite size that the Bible must have been one that traveled with Mary Lyon. 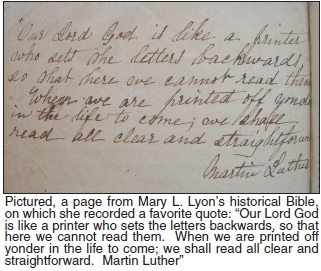 Church members noticed that Mary Lyon hand wrote her favorite Biblical passages in the back most pages of the book. They admired her neatly hand scripted notes in the margins throughout the Bible. They noticed that Mary Lyon had book-marked several pages, perhaps for the purpose of swift effortless look-up. Some church members might have pondered whether the Bible's marked pages, scripted so lovingly and devotedly, are something that only occurred during bygone eras. Or perhaps, the return of this community treasure to its origin is a sign of things to come. 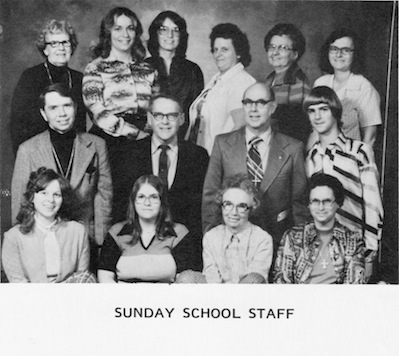 After Shirley VanNest received the inquiry and spread the news, she wrote back to Nance Moran asking for more details about how the Bible had been found. Nance responded that sometime between the years 1977 and 1978 her father, Lester Zakrzewski, was working as a heavy equipment operator in Wellesley, Massachusetts. 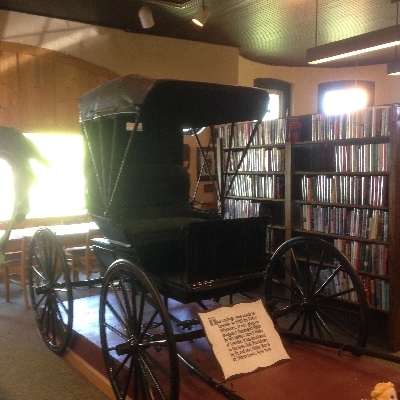 The town had a special location for recycling, where many books were deposited. Lester spotted the Bible on top of the recycling pile and wondered, Why would someone throw away a Bible? He picked up the ornate leather-bound Bible and browsed through it. 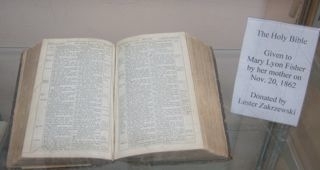 When he noticed the dated inscription on the second page, indicating its historically significant link to the Village of Lyons Falls, Lester decided to salvage it by taking the Bible home. One might wonder how the historical Bible ended up approximately 300 miles due east of Lyons Falls in Wellesley, Massachusetts. Unfortunately there was no clear answer to this question, as no one knew what really happened. One rumor has it that a Lyon family member moved to Massachusetts. Another possibility is that it could have been inadvertently disposed of in an estate sale. Unfortunately, it is likely the truth will never be known. 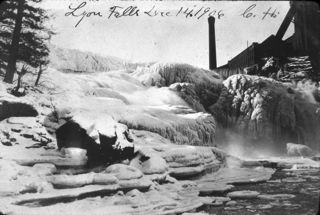 As luck would have it Lester knew about the historic Village of Lyons Falls. Earlier in his life, Lester was employed as a truck driver hauling cars to dealerships to be sold. 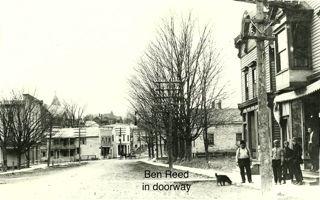 His route often took him through Utica, up New York State Route 12 to Watertown, and then on to the Thousand Islands region. 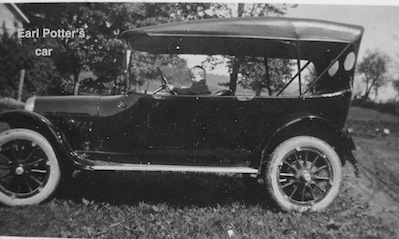 Because Lester had driven through Lyons Falls many times, he thought he would return the Bible to the Village on one of his trips. Lester did not bring the Bible home to Lyons Falls because he never drove through the Village thereafter. Nevertheless, he stored the historical Bible for safekeeping, with the hope that he would be able to return it one day. 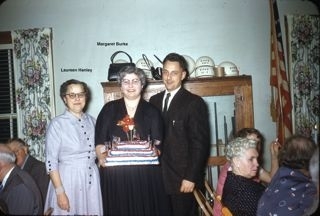 Nearly 20 years later, in 1996 after his wife passed away, Lester sold his home to his daughter, Nance Moran. Instead of clearing out his belongings, Lester left most of the contents of the house, including Mary L. Lyon's Bible, with his daughter. Nance found the Bible while cleaning out a closet a few years ago. She questioned her father about it and Lester relayed the same story. Instead of tossing the Bible away, Nance kept it. She says, I read through Mary's notes about passages and her favorite quotes. 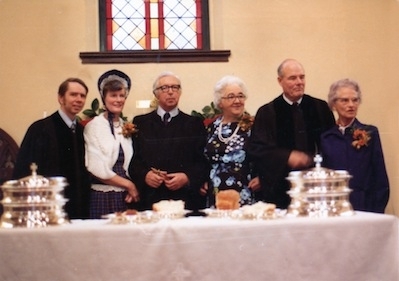 Through the years, the Bible and its quoted passages became personal to Nance. She felt a yearning to connect with those who might have searched for the lost Bible. 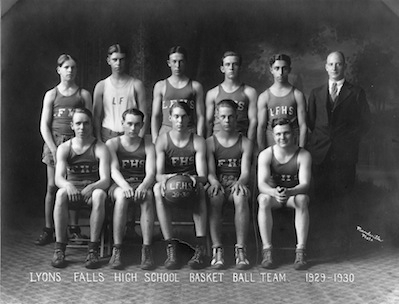 Nance began searching online to learn more about Lyons Falls, its history, and its people. She searched for contact detail of a person or organization that could appreciate the value and who would be interested in preserving the historical Bible. 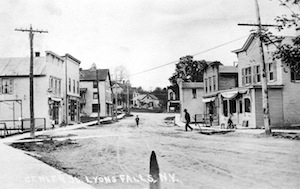 Fortunately for Lyons Falls, Nance persevered and finally connected with the Lyons Falls History Association. 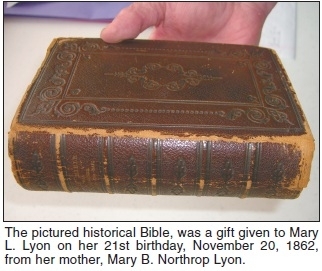 At long last, more than 30 years after it was found, the Mary L. Lyon Bible arrived via certified parcel post at the Lyons Falls Post Office a few weeks ago. 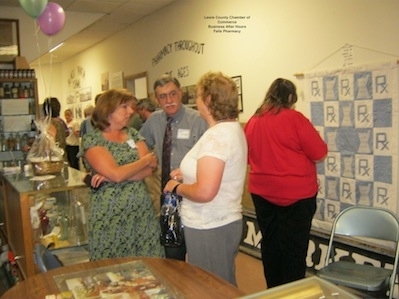 Roy and Susie Hammacker, President and Secretary of the Lyons Falls History Association, respectively, picked up the treasure, and brought it to the Lyons Falls History Association Museum, where it is now displayed in a place of prominence. A follow-up note from the finders arrived after the historical Bible had been returned. Nance wrote that she and her father were so happy that after all the many long years gone by, the treasured historical Bible had finally found its way back home to Lyons Falls where it belongs. 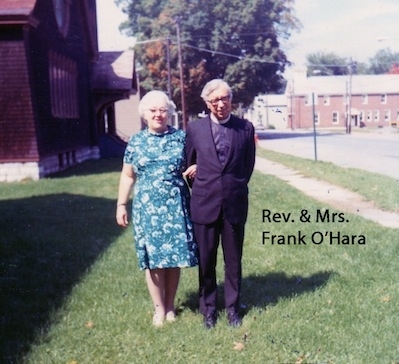 As they were sentimental about the Bible, Nance and Lester began talking about coming to visit Lyons Falls and the History Association Museum soon after sending the treasure on its way. 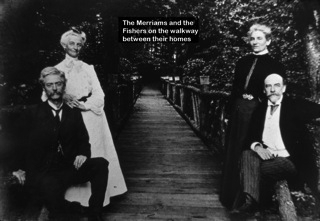 Needless to say, Lyons Falls Village, the Lyons Falls History Association and Museum, Forest Presbyterian Church, and the owners of the historic Mary L. Lyon Fisher homestead all welcome their visit with open arms. Kathy Ziemke resides in Lyons Falls and was a town correspondent for the Boonville Herald. 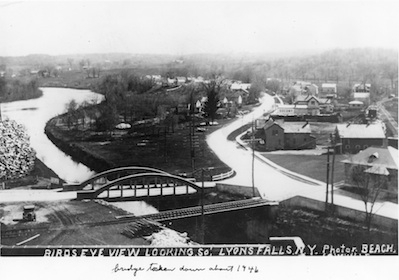 Prior to 1909, Lyons Falls did not have an organized library. 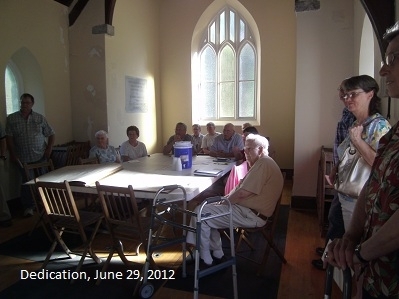 Rather, the village had a popular reading room and lending library, which had been started by the Men's Club. 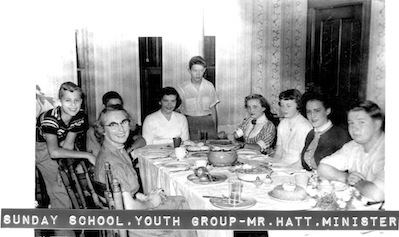 Due to the success of the reading room and the lending library, William Elliman organized a group of young people to secure funds for the new library by selling subscriptions, hosting social events, and playing movies for the villagers. The library started out with a small collection of books, most of which were gifts from local villagers. On October 28th, 1909, the Lyons Falls library was granted its Provisional Charter. The library started out with a small collection of books, most of which were gifts from local villagers. Mrs. O.E. 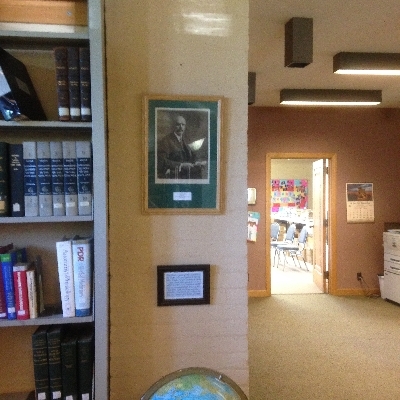 Davis led the library for many years. Mrs. H.P. Gould who served for 38 years succeeded her. In 1923, the library was granted an absolute charter from the State of New York. 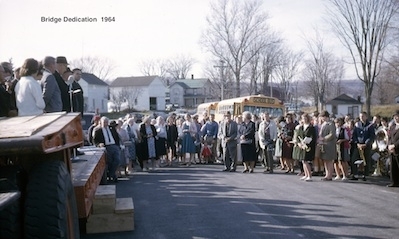 At this time, the library was funded by grants from the village board. 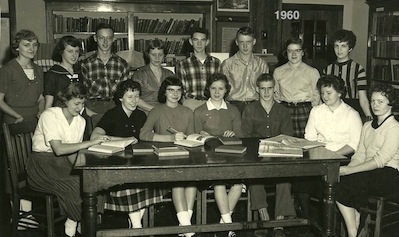 This system changed in 1948 when the library was granted membership to the North Country Library System. 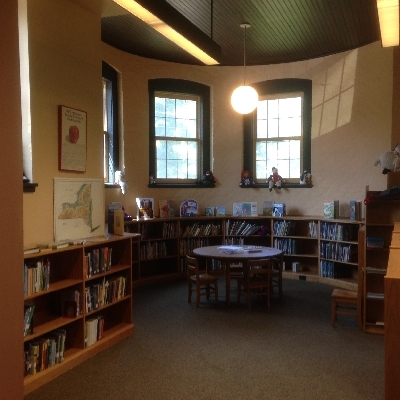 Under the new library system, Lyons Falls library was able to offer more services to the patrons of the library. 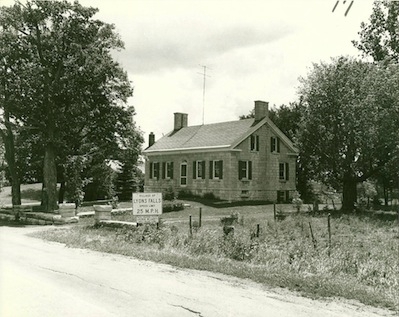 Until 1981, the library made its home in several locations around the village. 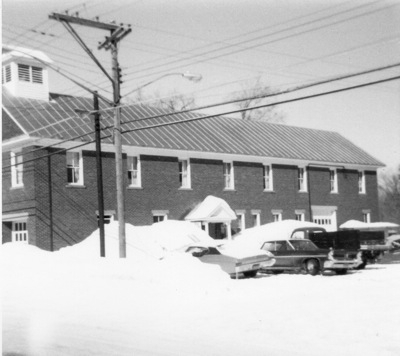 In 1981, the library found a more permanent home in the old fire hall on Center Street. 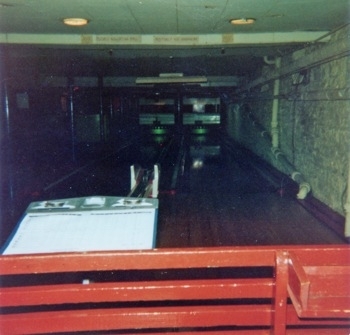 Also housed in this building was a bowling alley. The library made its final move to the old carriage house next to the Gould Mansion when the old firehouse was to be torn down. Mark Folino, a local Boy Scout who wanted to win his Eagle Scout Award, made the move to the Carriage House on High Street possible. 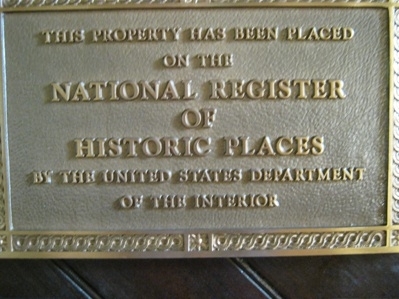 The Library Remains in the Carriage House of the Gould Mansion under the management of the Mrs. Carolyn Le Van. 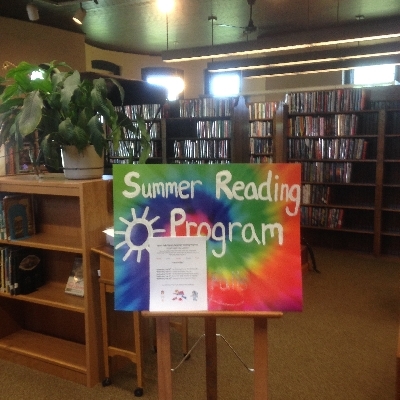 The library offers a variety of services to its members of the community. Community members are able to enjoy high speed internet, access to a fax machine, copier, and a photo printer, a large variety of books, magazines, audio books, and large print books, as well as access to the interlibrary loan system for any books Lyons Falls does not own. The library is open Tuesday and Wednesday from 3:00 to 7:00PM, Thursday and Friday from 1:00 to 5:00 PM, and Saturday from 8AM to 12PM. The Library is closed on Sunday and Monday. 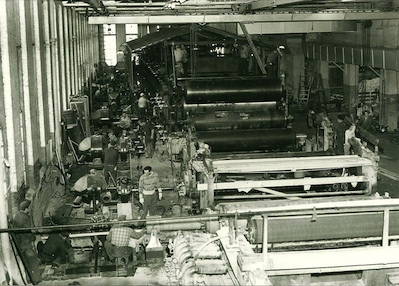 GOULD PAPER COMPANY Gordias H.P. 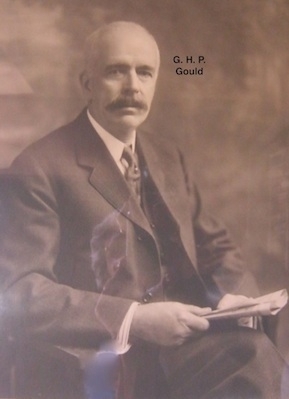 Gould was the founder of the Gould Paper Company. 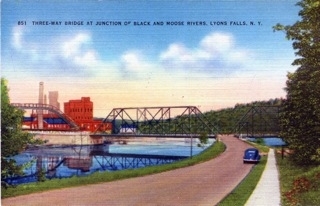 After previously owning a saw and pulp mill a mile up the Moose River in partnership with the daughters of Lyman Lyon, he purchased property at the junction of Black and Moose Rivers at Lyons Falls and built a paper mill there. 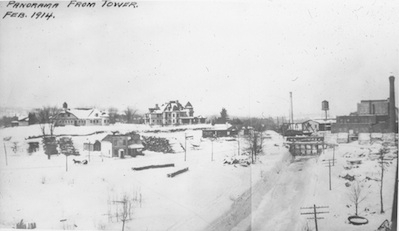 The paper mill opened in 1895. 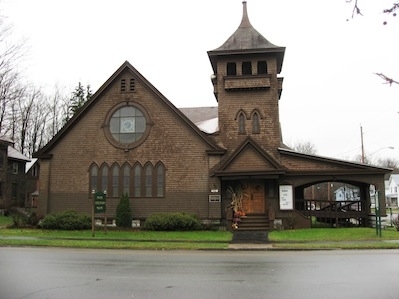 In 1902 Mr. Gould built a home of Gouverneur marble across from the mill under the supervision of the architect of the Forest Presbyterian Church on Center Street. 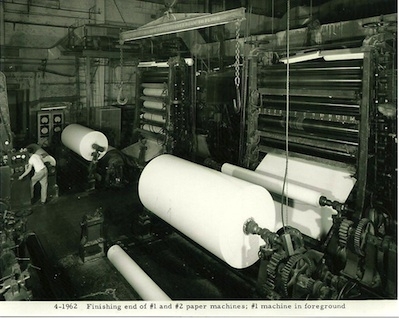 His son Harry P. took over operation of the Gould Paper Company following his father's death in 1919. Gordon H.P. 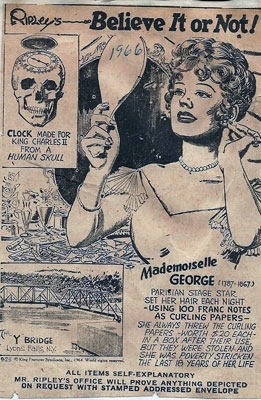 Gould became president of the company in 1938. 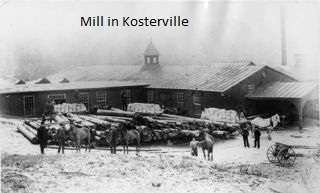 The Mill soon became the largest employer in the area. 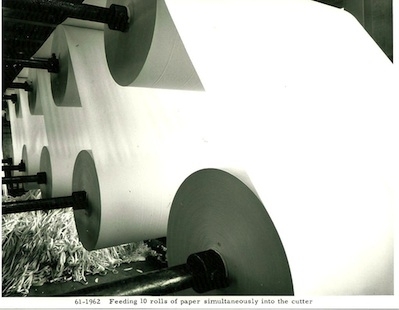 In 1945 Continental Can purchased the mill and produced specialty paper and newsprint. 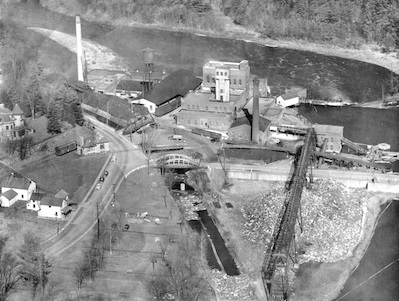 In 1956 the Lyons Falls Paper Corporation took over operations. They put in a hardwood pulping plant. 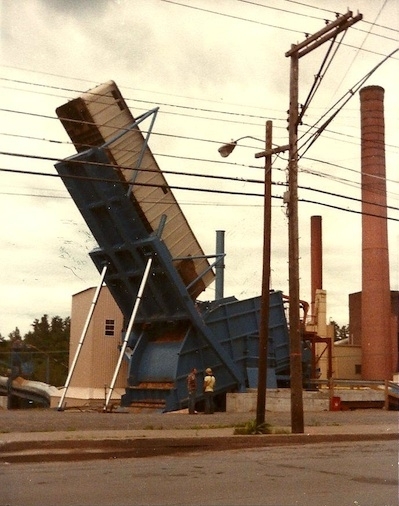 They were the first paper maker in the country to use this type of process. 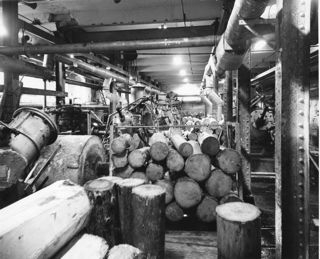 In 1962 the Mill was purchased by Puget Sound Pulp and Paper Company. A year later, the mill changed hands again when it was taken over by Georgia-Pacific. 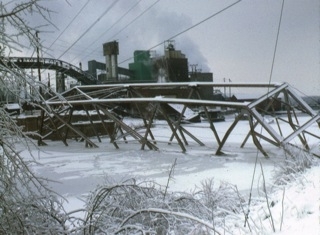 In 1985 Georgia-Pacific sold the mill to the Lyons Falls Pulp and Paper Company. The mill closed for good in 2000. 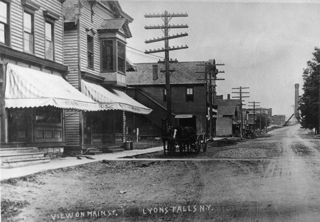 It remains a skeleton on Center Street, reminding the people of Lyons Falls of what once was the village's largest enterprise. 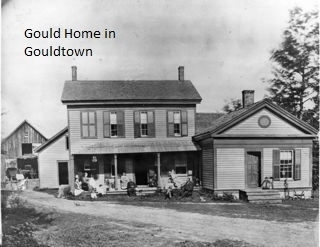 Christopher Gould, one of the early pioneers of Lewis County, and patriarch of the renown Gould family of Lyons Falls, arrived in the county in 1829. 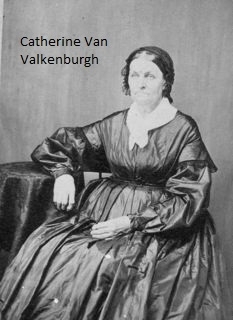 With him were his wife, Catherine Van Valkenburgh, and their six children. Four more children were born to them (two sons died in infancy). 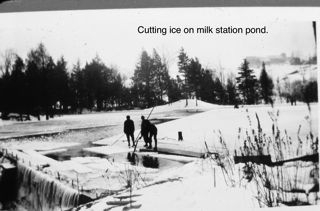 Their farm was near Fish Creek in what is now the Town of Greig. Christopher was a farmer, carpenter, and an expert mechanic. 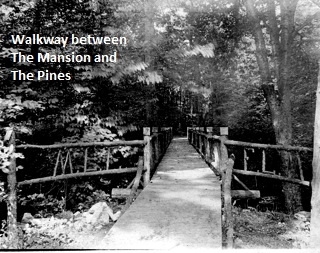 He followed these trades on his farm until 1859 when he moved to the village of Lyons Falls. He died there in 1882 at the age of 92, just eighteen hours after the death of his eldest son Gordias Henry. Gordias Henry Gould had learned the trade of wheelwright and in about 1840 established a sash and blind factory in Lyons Falls on the creek that ran through village. Gordias was said to be very gifted mechanically and could do anything requiring the use of tools. 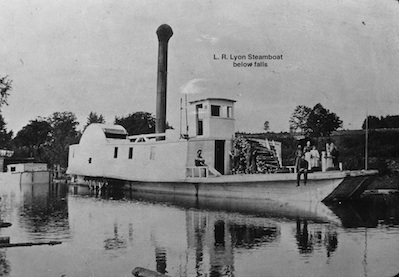 He is credited for building the first steamboat to be put to use on the Black River. 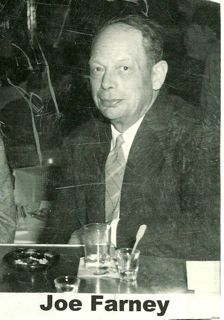 Although Gordias Henry Gould never sought public office he was active in politics and community affairs. 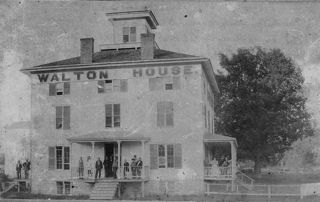 He built the Walton House in Lyons Falls and he built all of the lockhouses between Lyons Falls and Boonville. 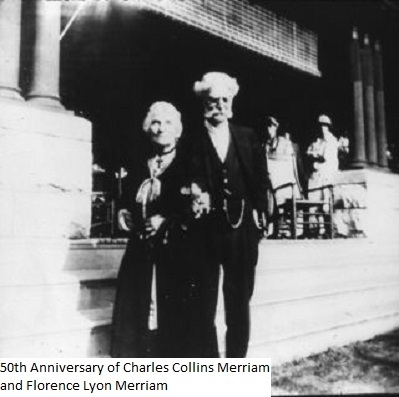 He married Mary Elizabeth Plumb in 1847 and they were the parents of three daughters and one son, Gordias Henry Plumb Gould. Gordias Henry Plumb Gould was known as G.H.P. Gould, and he became one of the wealthiest men in New York State. Following school G.H.P. 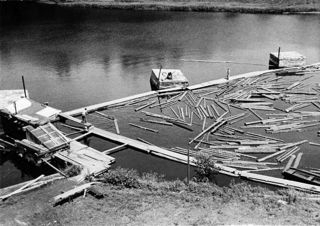 Gould worked as a bookkeeper for Snyder brothers tannery in Port Leyden and in 1869 he purchased a tract of timber on the Moose River. 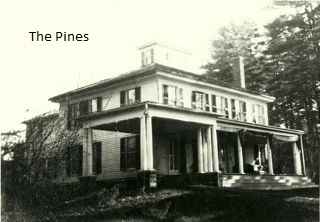 He built a sawmill and sawed his own timber until 1874 when he formed a partnership with the three daughters and heirs of Lyman R Lyon. 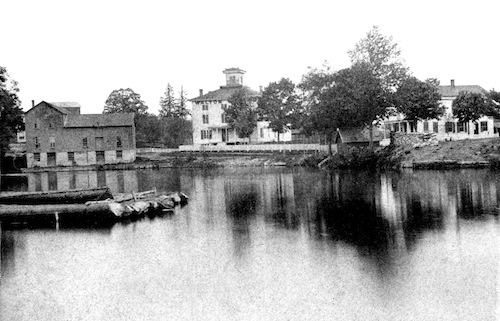 The firm Lyon and Gould purchased a mill just up the Moose River from Lyons Falls, Gould settled there and founded the hamlet known as Gouldtown. He soon bought out the Lyon interests and continued to buy mills and forest lands in the United States and Canada. In 1894, he built the pulp and paper mill at Lyons Falls and then built the magnificent home near the mill known as the Gould mansion. G H P Gould was very active in public affairs and was elected to the State Assembly for four terms even though he was a Democrat in a very Republican county. 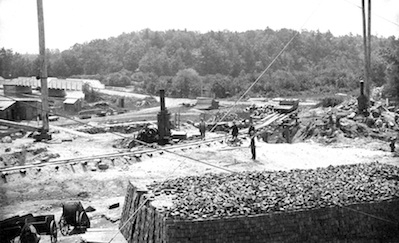 He was instrumental in securing protection for the Adirondacks by helping establish the Adirondack Preserve. 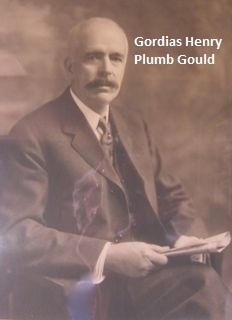 Gordias Henry Plumb Gould had three daughters and one son Harry P. Gould, who after his fathers death in 1919, took over the business interests. Harry P. Gould died in 1938 . 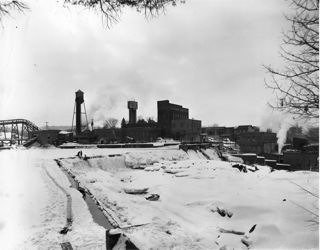 Although the once thriving Gould Paper Company in Lyons Falls no longer exists, the memory of the family responsible for it will long remain. 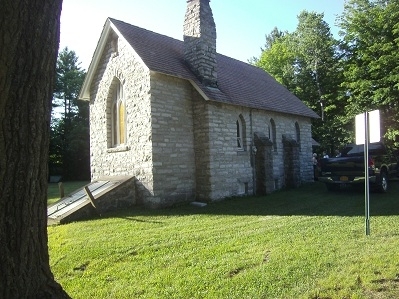 Forest Presbyterian Church has been an important part of the history of Lyons Falls since it was first organized in 1826 by a group of twelve men and women meeting in private homes. 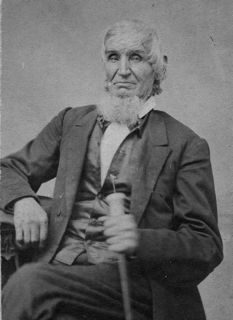 In the summer of 1853, the Reverend Dr. Thomas Brainerd, a native of the town of Leyden and pastor of Pine Street Church in Philadelphia, came home for a visit. He was so impressed in the interest of the people for a building of worship that he sent plans for a suitable building and helped raise the money needed to build the church. 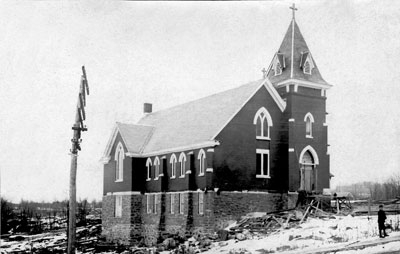 The church building was to be built on a point of land where the Black and Moose Rivers join near the waterfall. 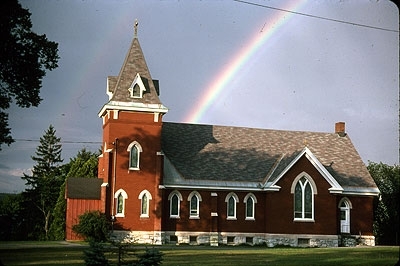 This church was a small wooden building dedicated on August 6, 1854. Standing in a pine grove, it was appropriately named Forest Church. This first church was on the east side of the Black River and required crossing a bridge to get to the village. 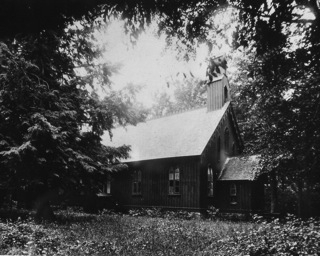 By 1892, the little church was badly in need of repairs and the village had developed on the other side of the Black River. It was decided a new church should be built in the heart of the village to better serve the people. 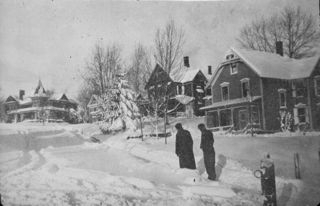 During the winter of 1892-1893, plans were drawn for the church to be built alongside existing parsonage on Center Street. 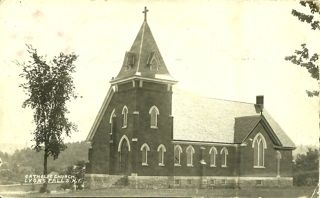 On Thursday, July 12, 1894, the new church was dedicated. 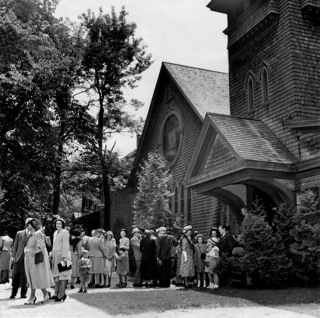 Of the 375 persons who attended, 20 were people who had attended the dedication of the original Forest Church in 1854. 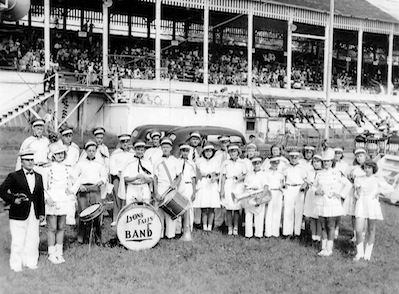 On the dedication day, G.H.P. 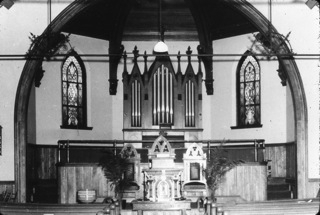 Gould, Treasurer, announced the church was free of debt as a result of his own generous donation. 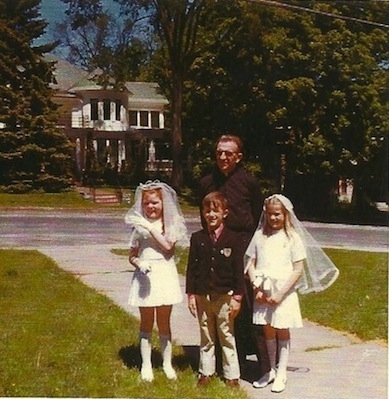 The cost of the church was $6,549.37. 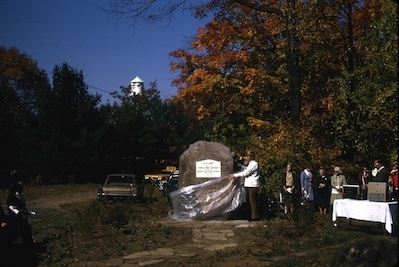 The old bell from the first church, presented by Lyman R. Lyon, was installed and is still in use today. 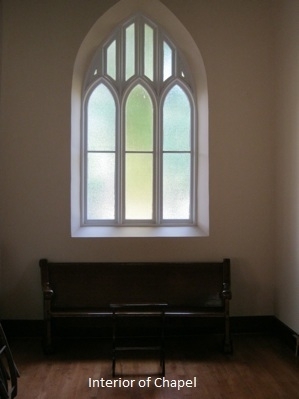 Several of the windows are from the 1854 church. 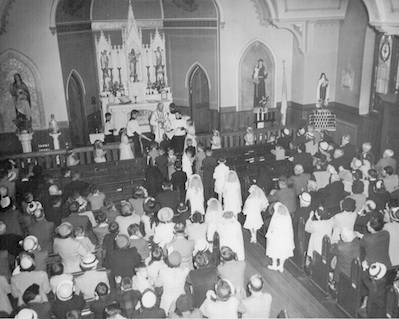 The Parish House was added in 1926 and was dedicated on the 100th anniversary of the original church, September 1,1826. 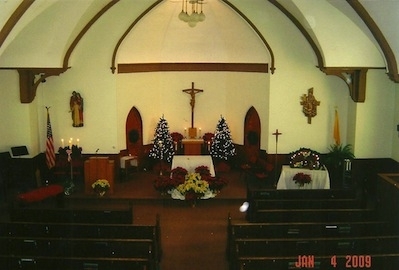 It was used as a center for church and community activities. 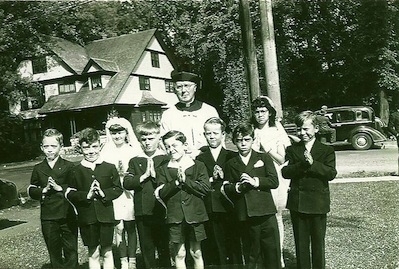 The Parish House continues to serve this purpose to this day. 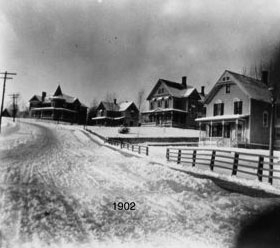 In 1902, the original manse, which had been built in the village when the church was still in the forest, was moved from the lot adjacent to the newly built church, to the end of the block and replaced with the existing larger manse to accommodate the pastor's large family. The new manse was built "in harmony with the architecture of the church" (O'Hara). 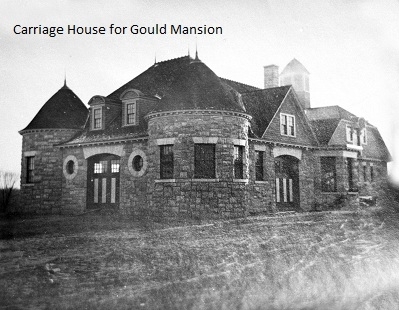 There is no evidence that the church architect was directly involved, however, he was at the same time building the Gould Mansion Complex (National Register Listed) just a block and a half away. In addition to the 1894 church and 1902 manse, there is also a 19th Century barn located behind the manse. 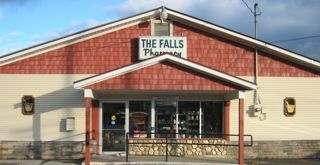 If you live in Lyons Falls or the surrounding area, chances are you've heard of the Falls Pharmacy. 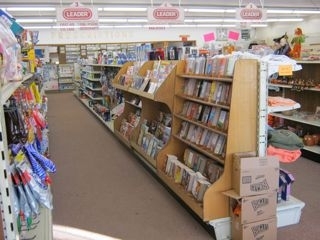 But there is a lot more to the Pharmacy than most people are aware. 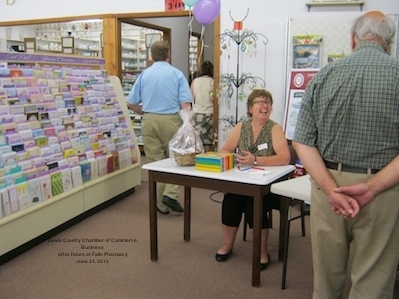 The Pharmacy was first opened in early 1899 under the ownership of Thomas Reed. 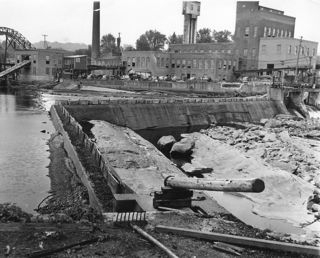 It was located on Center Street between the present day Dorrity's Restaurant and the old paper mill building. 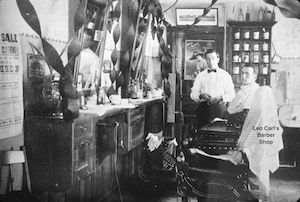 At this time, the Pharmacy was operated by Ben Reed and Louis Hilligas. The ownership of the drug store changed hands later on to Bernard and Bertha Reed and Elizabeth Hilligas Murphy and Helen Hilligas Payman. 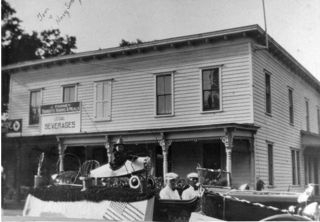 Under these owners, the drug store invested in an ice cream fountain and sold homemade ice cream as well as penny candy. 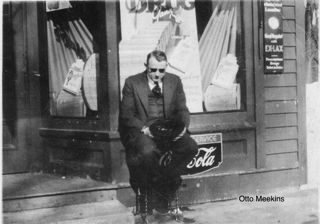 In 1933, the Reeds leased the business to Otto Meekum. 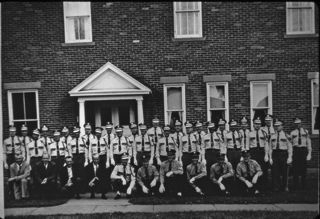 Eddie Emdin worked for Otto Meekum as a registered pharmacist until Nov. 1, 1938. 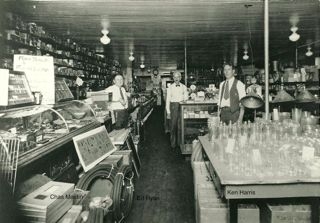 During 1939, the Reeds leased the pharmacy to Horton Hammecker. 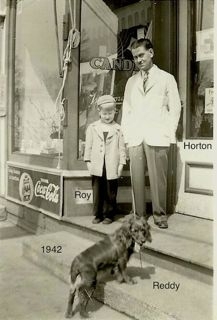 In 1948, Horton bought both the business and the building from the Reeds. 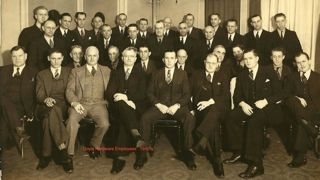 After Mr. Hammecker died in 1964, his son, Roy Hammecker, took over. 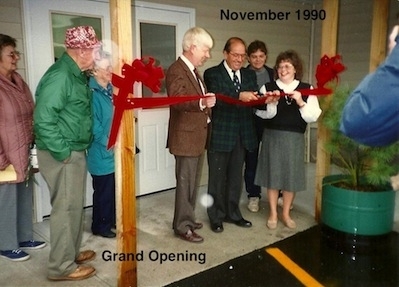 In 1979, Roy & his wife Susan moved the pharmacy relocated from its location on Center St. to its current location on the corner of McAlpine Street and Cherry Street. This building has also housed a clothing store, a hair salon, an antique shop, furniture store and a museum, to name just a few of the many businesses the building has seen through the years. 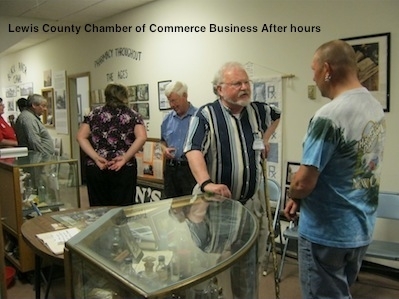 Currently, the Disabled Persons Action Organization and the Lyons Falls History & Pharmacy Museum are taking advantage of the convenient location in the rear of the Pharmacy. Also in the building is a Liquor Store owned by Ron and Mary Dorrity. One could say that the Pharmacy has become a family tradition to the Hammeckers. 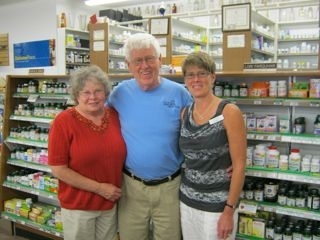 After Roy's retirement in 1998, his daughter, Lori Farquhar and pharmacist Curtis E. Ernst took over the business. Recently, Lori bought out Ernst. Time will tell whether a fourth generation of Hammeckers will take over the Pharmacy, when it comes time for Lori to retire many years from now. The work on the bridge by the bank on Center St. in Lyons Falls was very inconvenient for many of the Village businesses at the beginning of the summer in 2011. One of these businesses is Dorrity's Restaurant, owned by Cindy Dorrity. 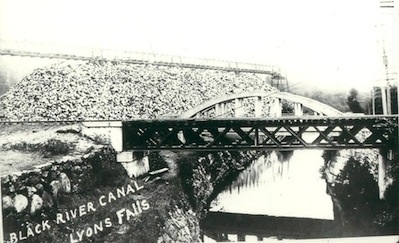 Like all of Lyons Falls, Dorrity's has an eventful past. 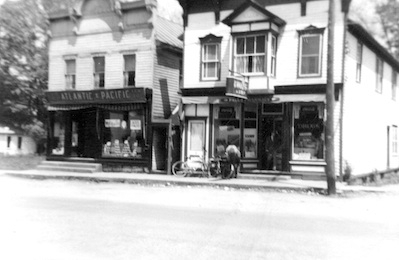 The building that houses Dorrity's Restaurant was originally Alfred Rocker's Store. 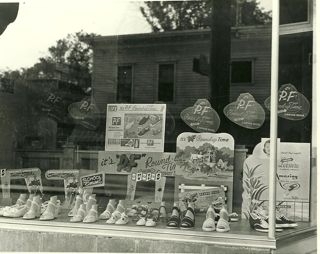 This store was built after the big block fire that destroyed half of Center St. in December 1949. 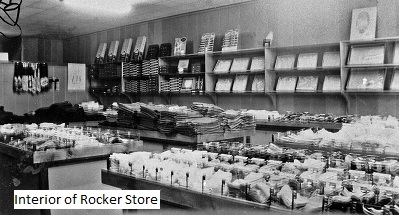 The original Rocker's Store was destroyed in the block fire, but the new building was built in the location of Dorrity's in 1950. 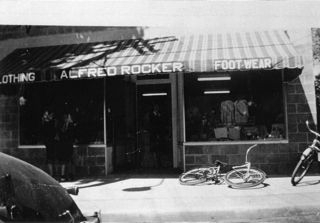 The store offered merchandise from shoes to clothing and many people remember buying shoes there. 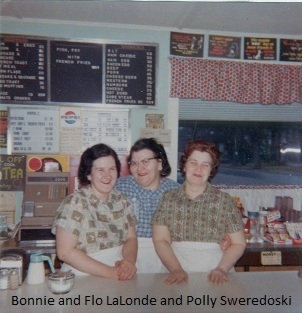 Florence and her husband, Henry LaLonde bought the building from Alfred Rocker and converted the shoe store into Flo's Restaurant. 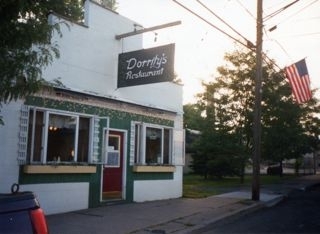 Terry and Ann Dorrity bought the restaurant from Flo LaLonde and changed the name to Dorrity's. 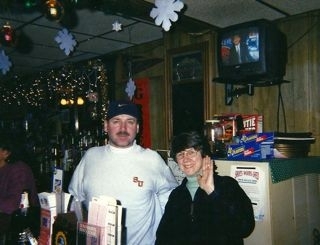 The restaurant changed hands again from Terry and Ann to Maggie Dorrity, and then to Dale Dorrity. 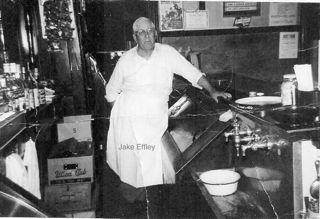 Altogether, the Dorrity family owned the restaurant for around twenty-two years. 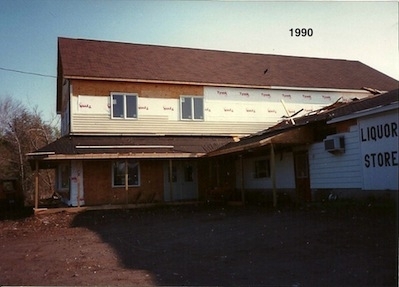 After a fire around 1995, Dale sold the restaurant to Catherine Buckingham and Dorrity's became the Strawberry Patch. This restaurant closed December 13, 1997. Cindy Dorrity bought the restaurant in August 1998 and opened her new restaurant September 3, 1998 once again bearing the family name. 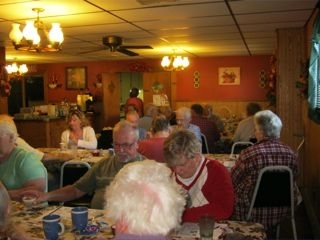 Now, Dorrity's Restaurant is a popular morning breakfast spot for some Lyons Falls' residents. The construction on the bridge didn't deter them from their morning treat. If you haven't eaten at Dorrity's before, be sure to stop down. There is great food in a casual environment. Dorrity's is definitely Lyons Falls' version of a hometown diner. Business hours are from 5:30 a.m. to 2:00 p.m. Mondays and Tuesdays, 5:30 a.m. to 7:00 p.m. Wednesdays and Thursdays, 5:30 a.m. to 8:00 p.m. on Fridays, and 5:30 to noon Saturdays and Sundays. 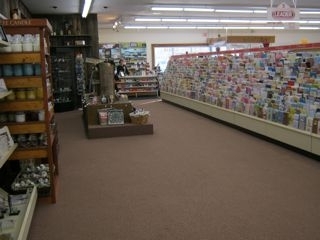 In 2006, Utica, New York was dealing with the sad departing of one of its favorite businesses: Doyle Hardware. This sad ordeal marked the end of a legacy that began in Constableville in 1872 by James Doyle and Terry Gormley. After Gormely's death in 1878, John Doyle joined his brother to manage the firm. 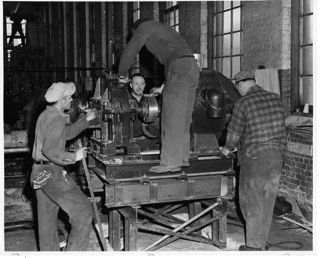 A third brother, Thomas Doyle joined his brothers in 1880, and the three changed the name of the firm from Doyle Hardware to Doyle Brothers. 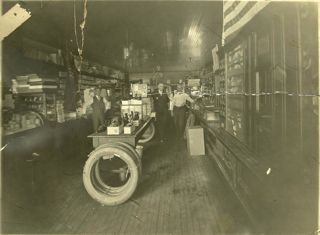 The store sold goods that included everything from paints and oils to drugs and medications to liquors and wines to stoves and other appliances, such as machines for farming. They also sold sleds, skis, skates, toboggans, sinks, irons, and other goods. 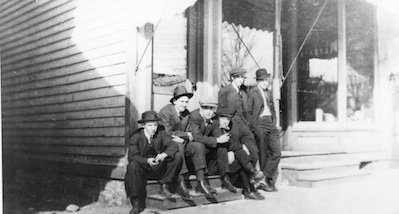 In 1899, the brothers decided to open a branch of their store in Lyons Falls. 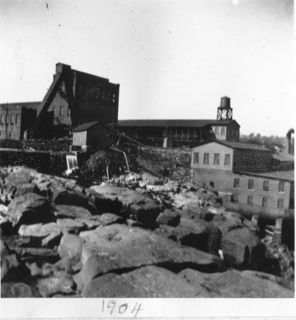 At this time, Lyons Falls was booming with business, thanks to the new local business enterprise, Gould Paper Co. 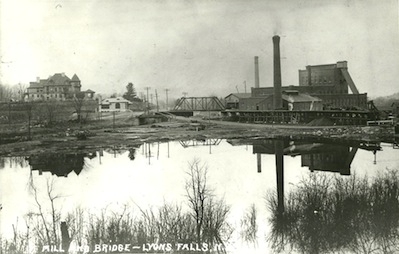 The Lyons Falls branch was the center of business for many years. In 1901, James Doyle's son, Frank, joined the firm. 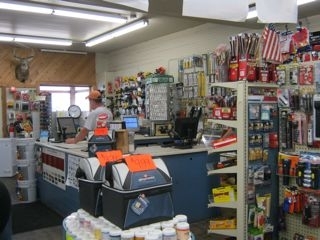 He urged his uncles and father to expand the variety of merchandise being sold in the store to encourage new customers to become part of the hardware business's clientele. 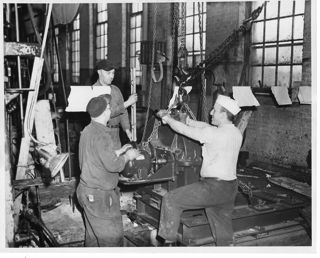 Not long after this, the firm took over the hardware business established by Lewis Riggs in Port Leyden. 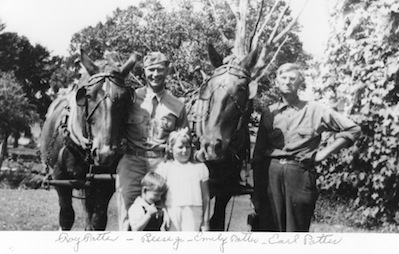 In 1923, the last of the original Doyle brothers passed away, leaving the business to Frank Doyle. 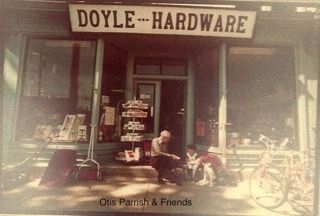 He changed the name back to Doyle Hardware and opened more branches throughout New York. 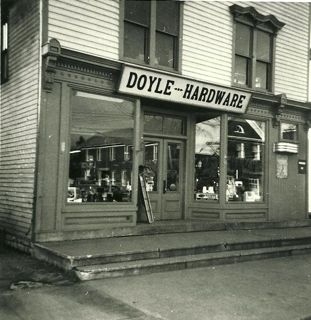 In 1943, James T. Doyle became a partner of Doyle Hardware. At this time, the company had its main offices in Utica, New York. 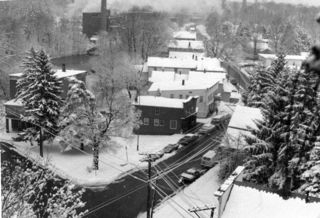 At its peak, the firm had stores in Utica, Newport, Dolgeville, Lyons Falls, Constableville, Port Leyden, Richfield Springs, Norwich, Fort Plain, and Cazenovia. But sadly, the prosperity of Doyle Hardware began to dwindle. 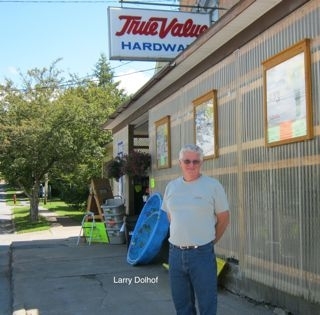 The last store of the once prosperous Hardware chain was located in Utica. 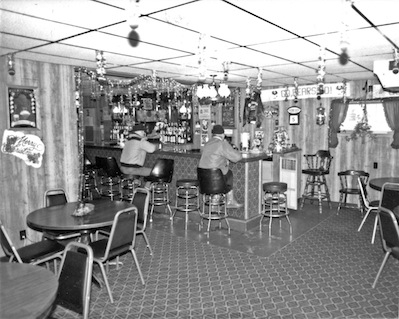 As for the branch in Lyons Falls, in 1976, Larry Dolhof and his parents bought the business. They changed the name to Dolhof and, in the early 1980s, Larry Dolhof bought out his parents for full ownership of the store. At this time, Larry was only in his thirties. Now, Larry has ten employees and loves the store. He says that owning a business in Lyons Falls is great because it is in his hometown, the residents are very supportive of him and his business, and in return, he loves being an active member in the community. 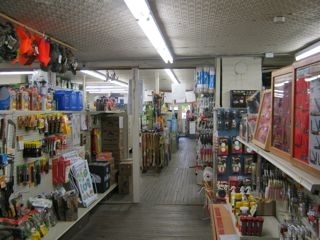 And although Doyle Hardware is no more, Lyons Falls is fortunate to have such a great business in its place. People like money. That's not a ridiculous statement. This statement is proven true by the amount of banks in society today: HSBC, Key Bank, Community, Northern Federal Credit Union, etc, etc. 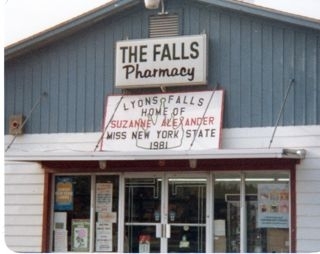 But there are some who remember when Lyons Falls wasn't a part of the name-brand banking system. 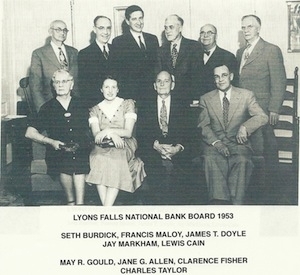 Some people remember when Lyons Falls National Bank was the center of Lyons Falls' banking needs. 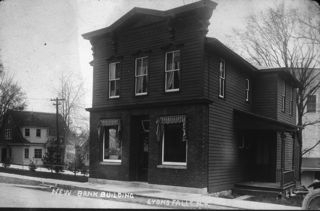 The Lyons Falls National Bank originated in September of 1925 on Center Street in Lyons Falls. 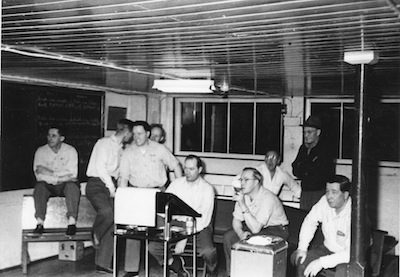 At this time, it was directed by a group of men and President, George Cannon. 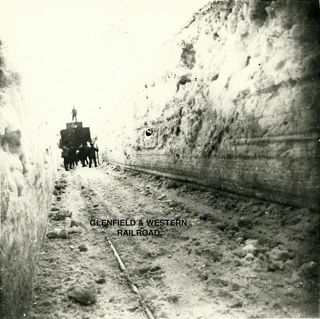 After a bank robbery, the bank was reorganized in 1930 by Harry P. Gould, president of the Gould Paper Co. Mr. Gould served as President while Clarence L. Fisher served as Vice President. Throughout the years, there were many other directors and leaders of the bank, including Gordon H. P Gould, James Doyle, May Gould, Seth Burdick, Fred Sheldon, Lou Cain, Jane Allen, Charles Taylor and Roscoe Reeder. Some cashiers that may be well remembered are Francis Maloy, Clifford Beadle, and Francis Cox. 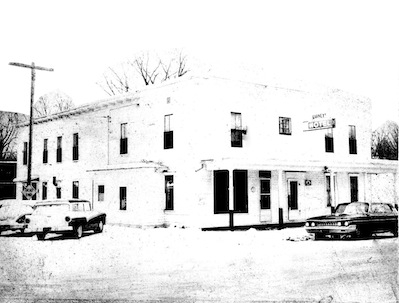 In 1982, the Lyons Falls National Bank was sold to Key Bank. 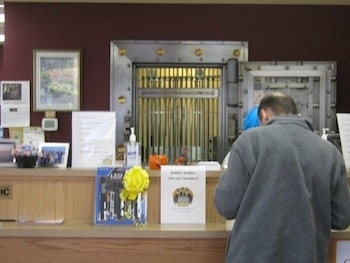 Since then there have been two other banks in charge before the Lyons Falls branch of Community Bank was opened. Running a bank is no easy feat, especially in today's society. People seem to be making a lot more money nowadays, but the penny isn't going nearly as far as it did previously. Even interest rates were drastically different back then. Jane Allen commented how, when she was President, interest rates on a standard savings account would be close to 15%. Now, most savings account had an interest rate of about 1%. That is quite a change! When asked what made the bank so profitable, Mrs. Allen told that Gould Paper Mill Co. had quite a few accounts there, but what really made the bank succeed was the support and loyalty of their customers: It was a real friendly place, you know. Doing the research for the different SpotLights, all the business owners have professed how wonderful the people in the Village really are. 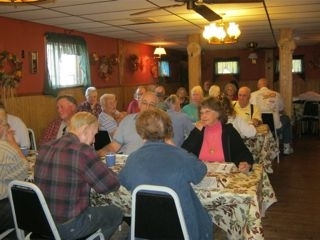 Like Jane Allen says, Lyons Falls has "a lot of loyal customers" and "good employees." Those are a few of the reasons why Lyons Falls is such a nice neighborhood.